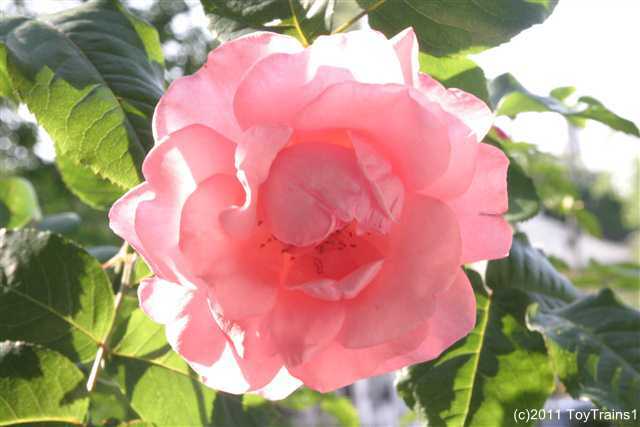 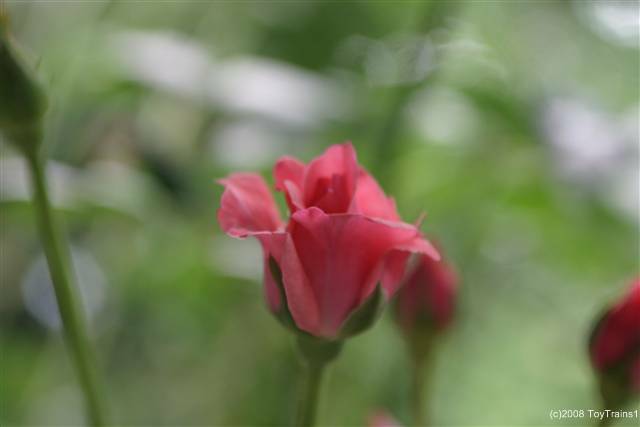 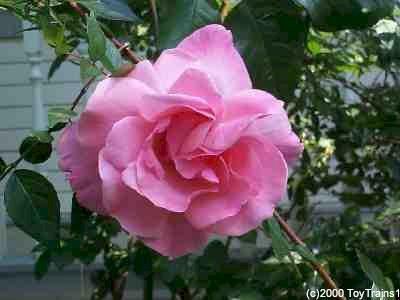 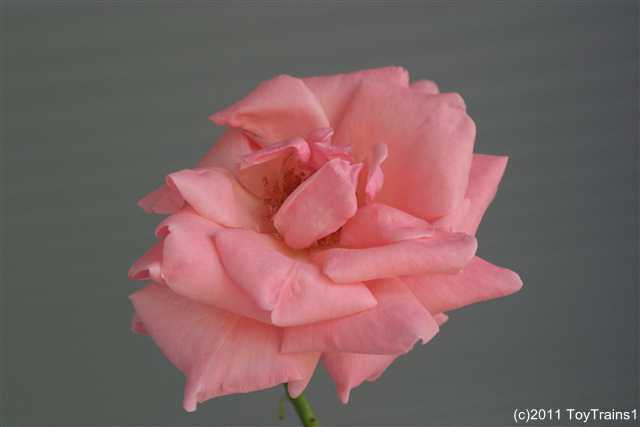 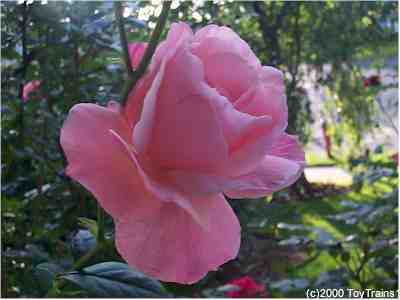 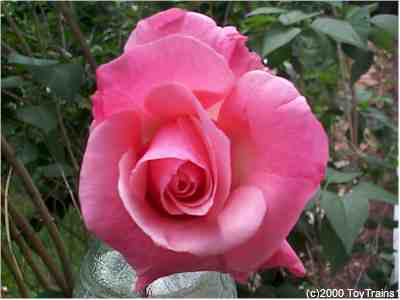 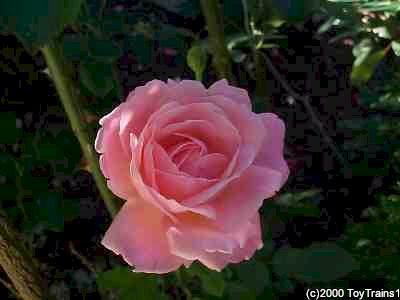 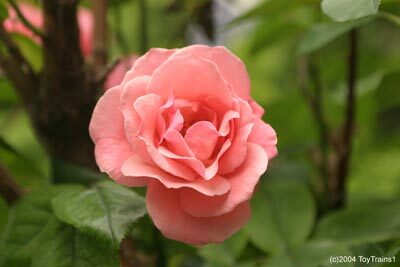 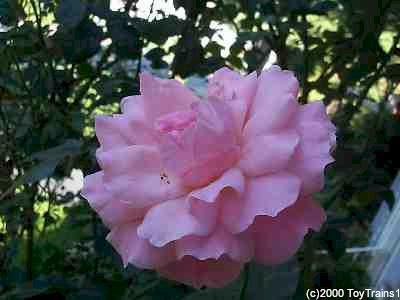 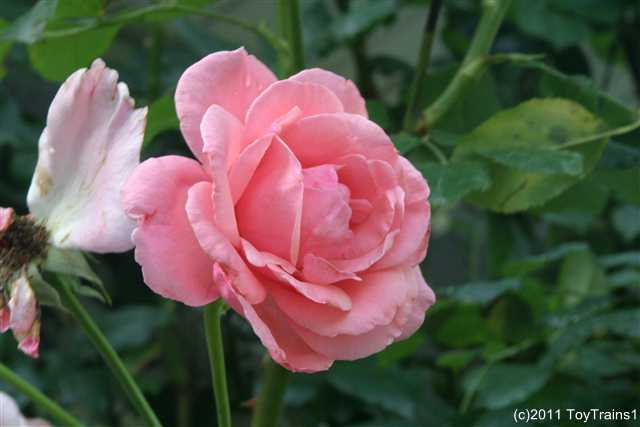 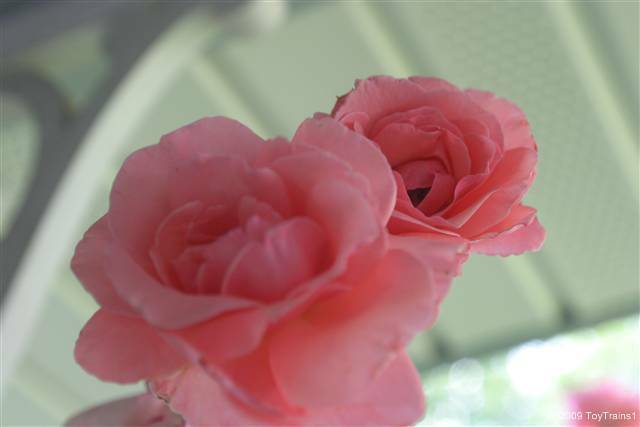 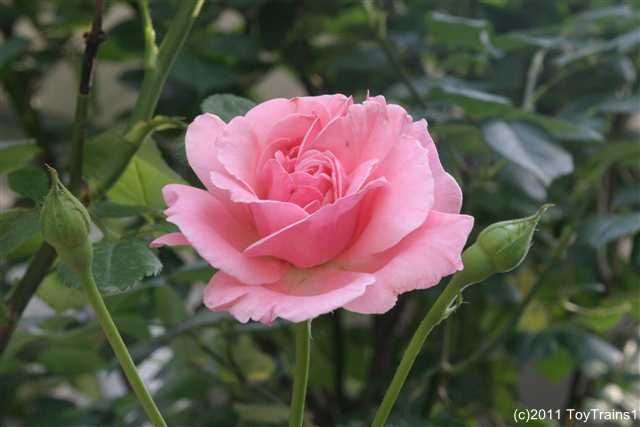 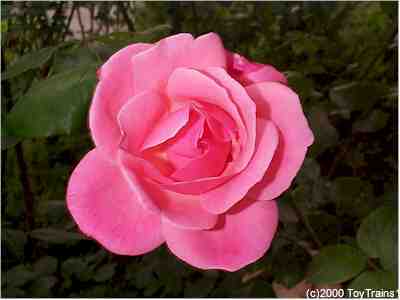 This is the grandiflora Queen Elizabeth. 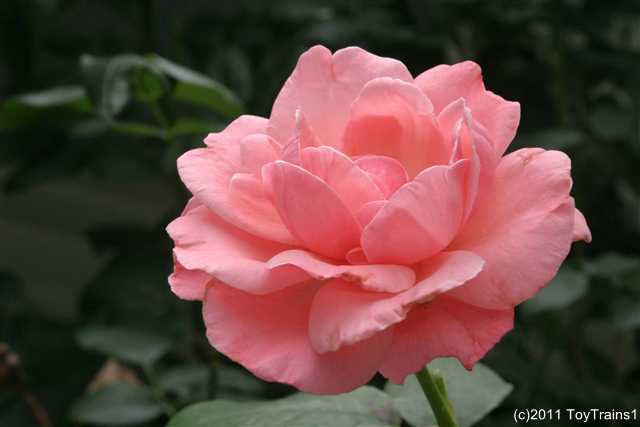 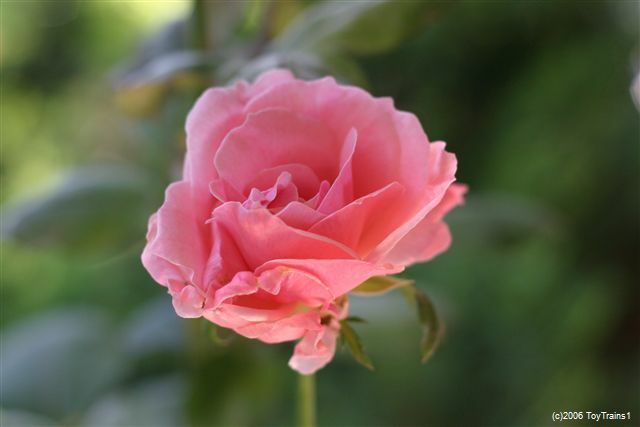 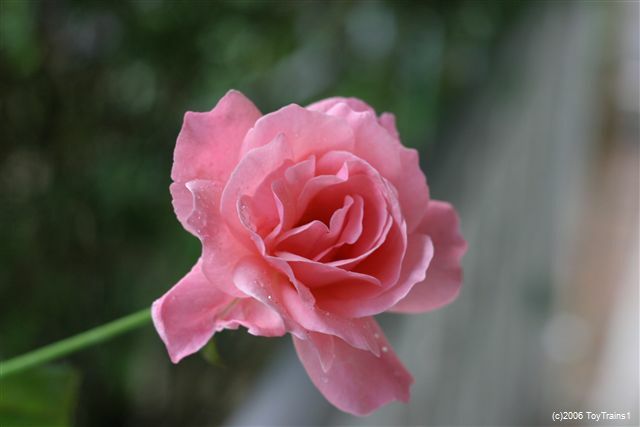 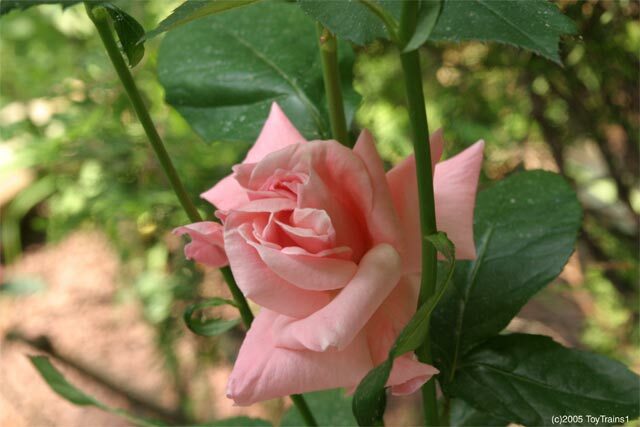 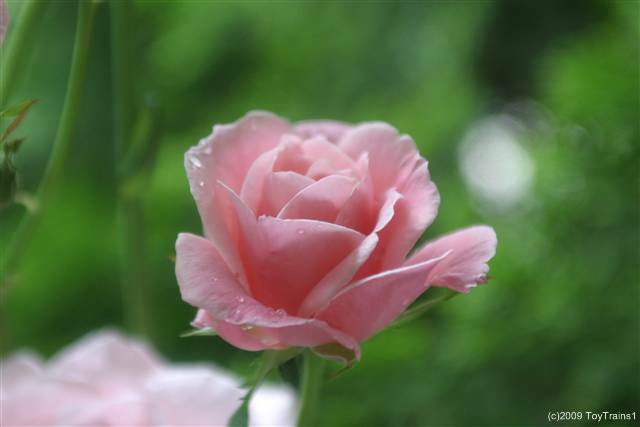 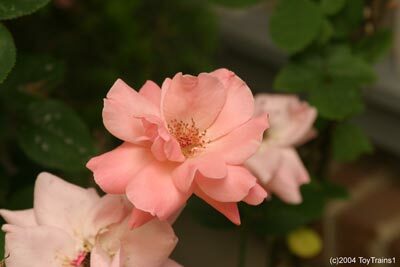 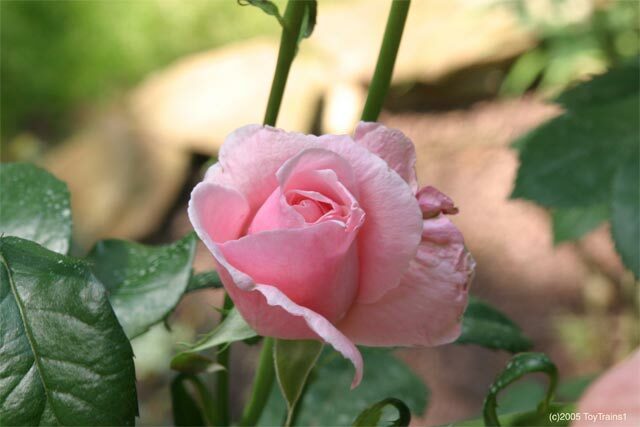 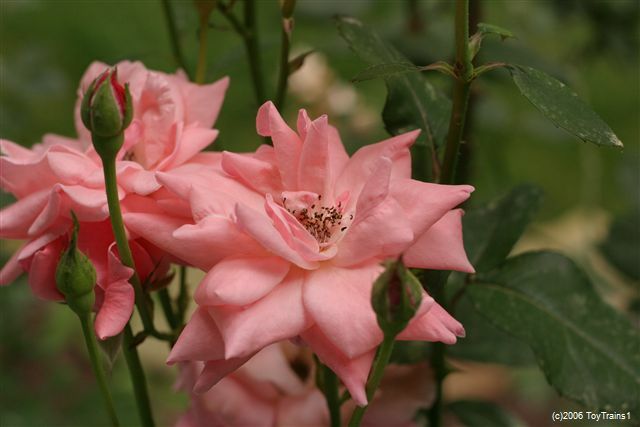 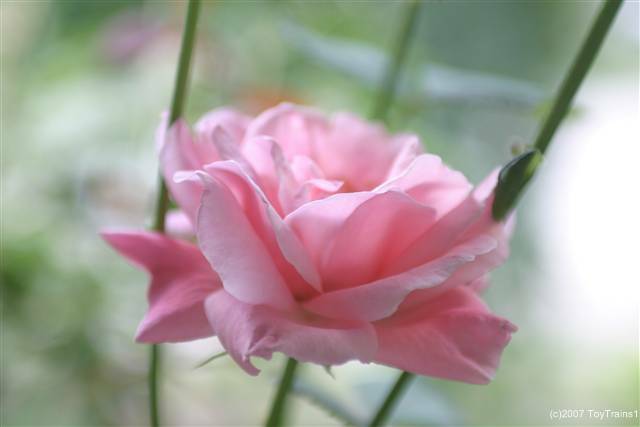 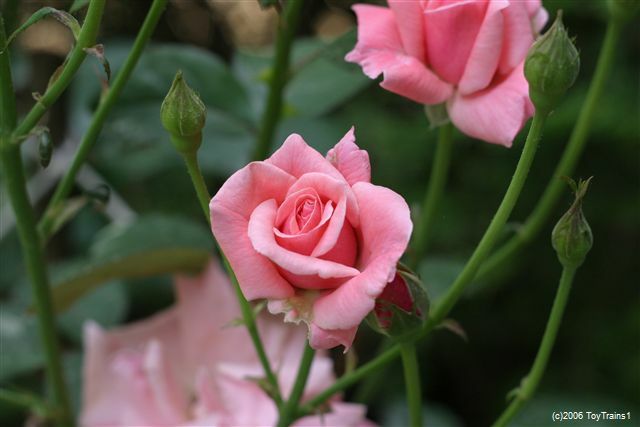 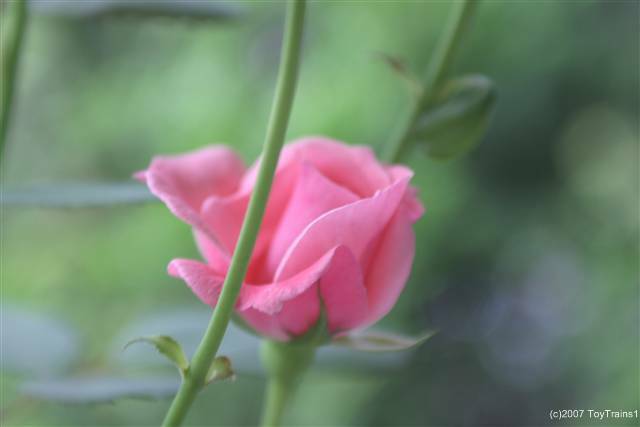 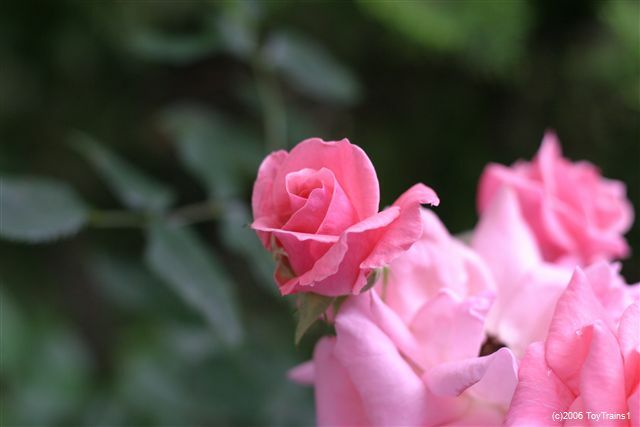 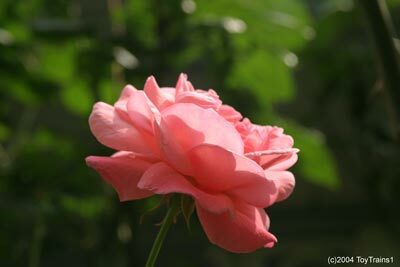 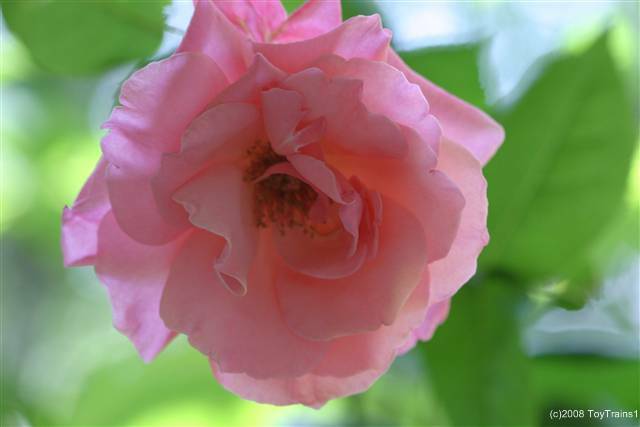 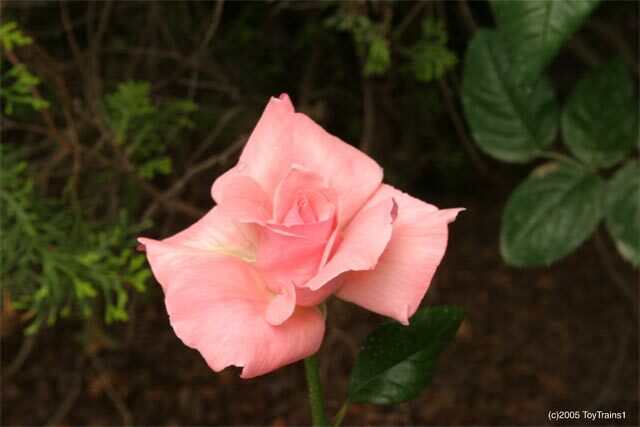 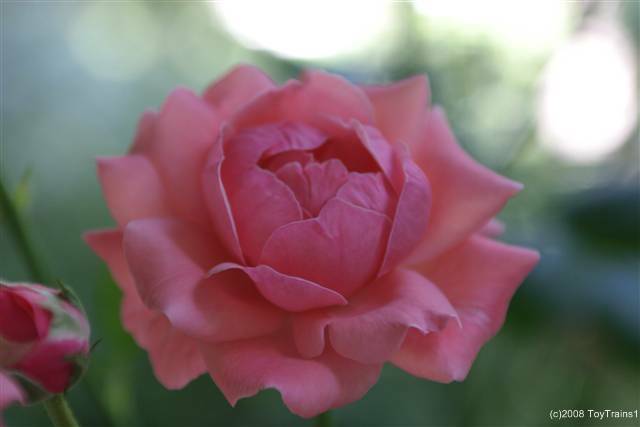 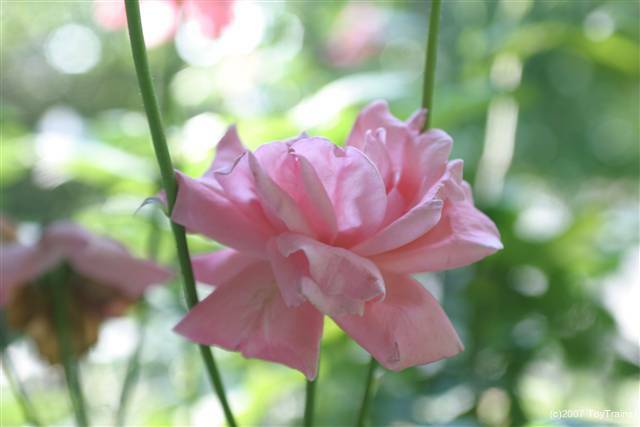 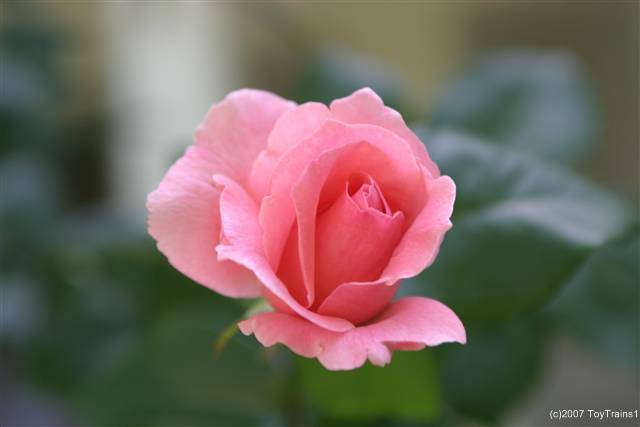 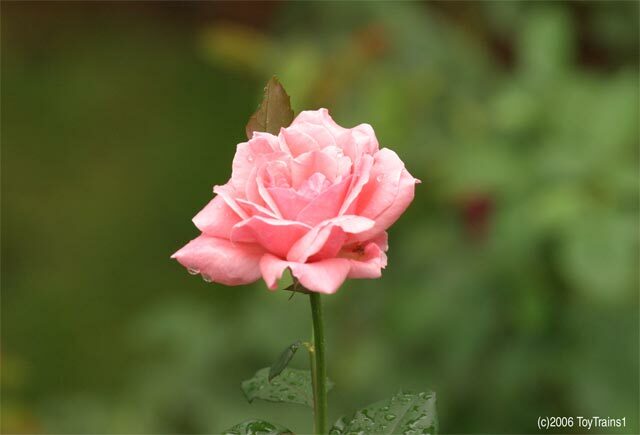 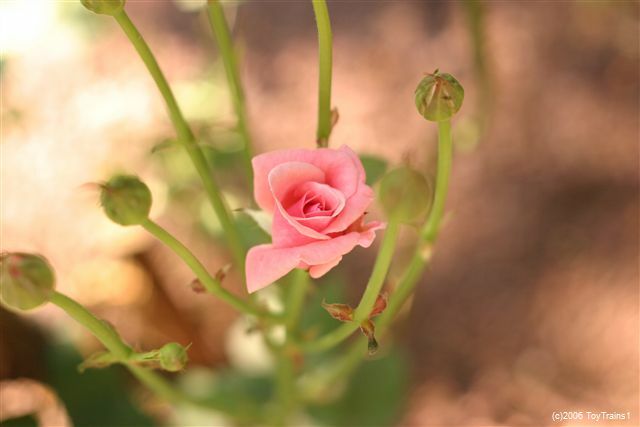 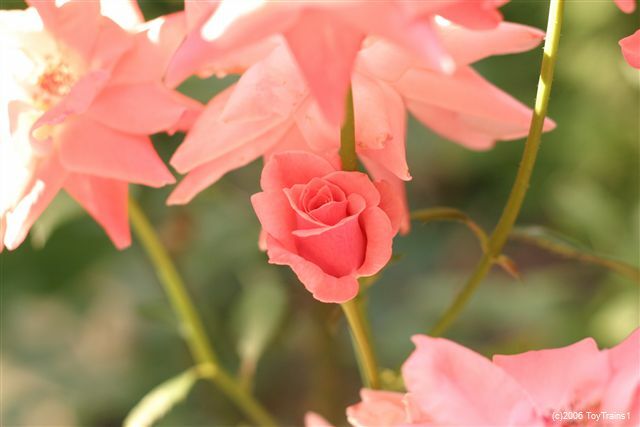 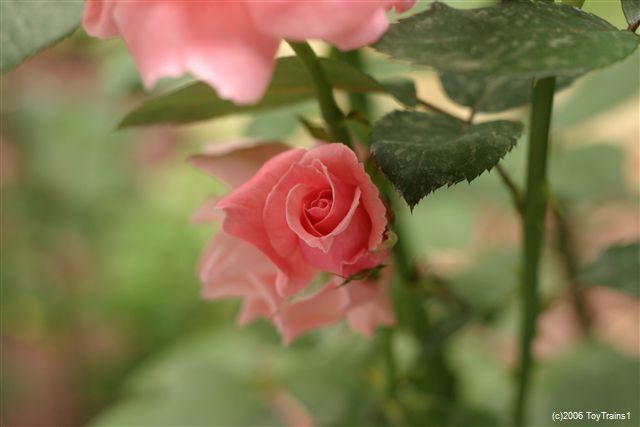 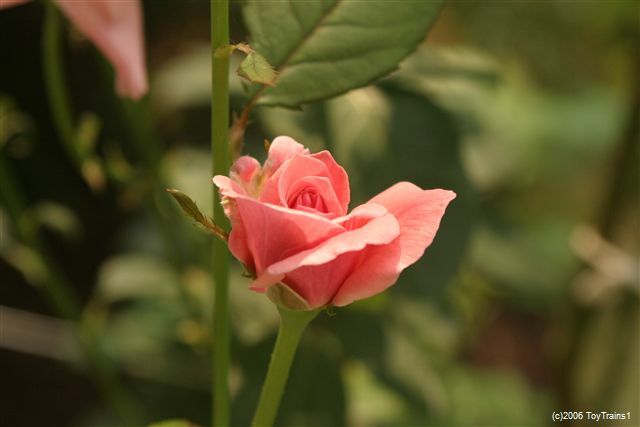 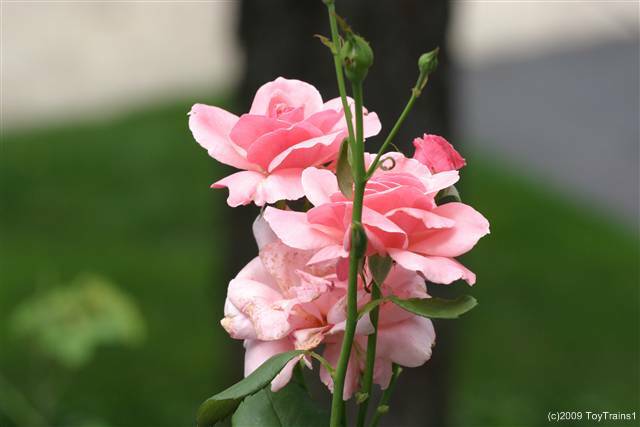 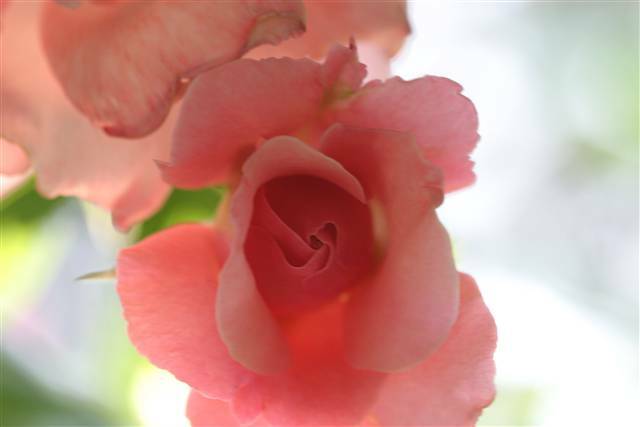 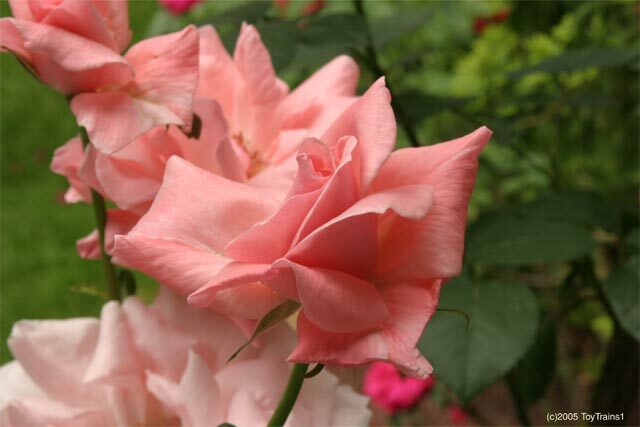 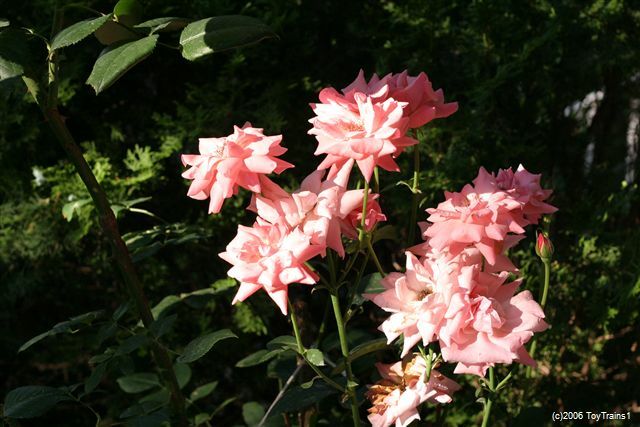 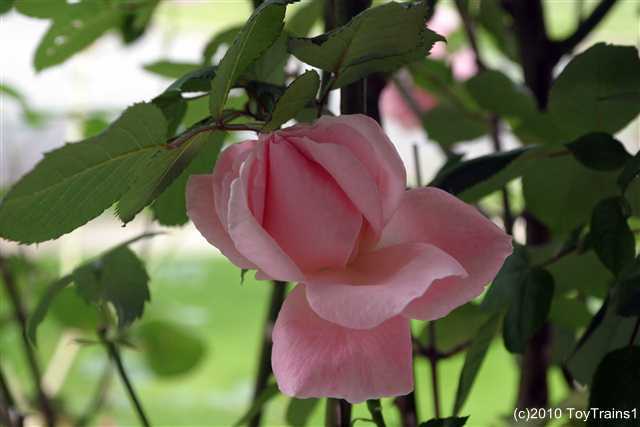 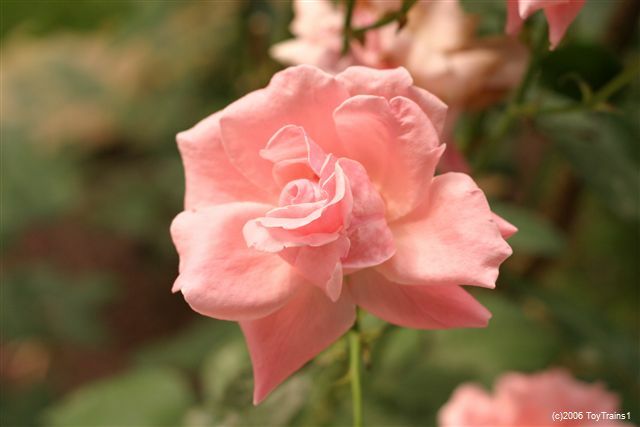 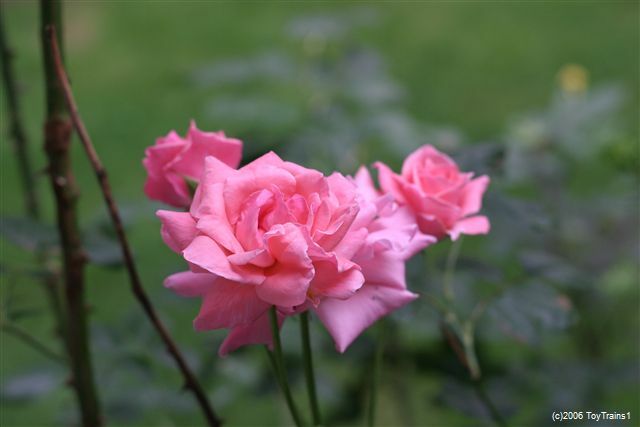 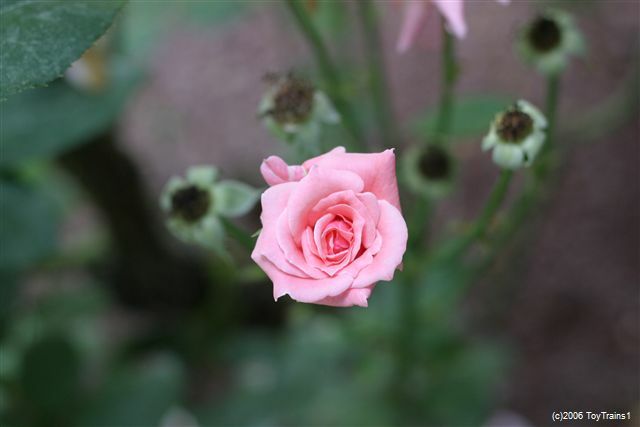 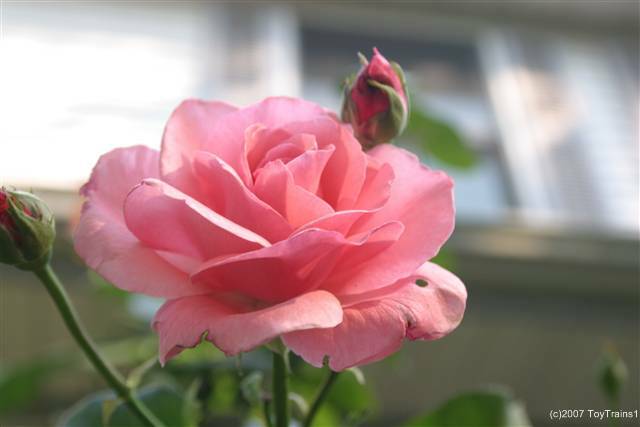 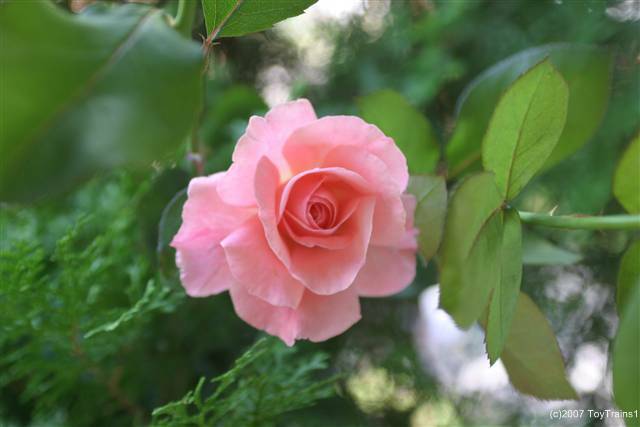 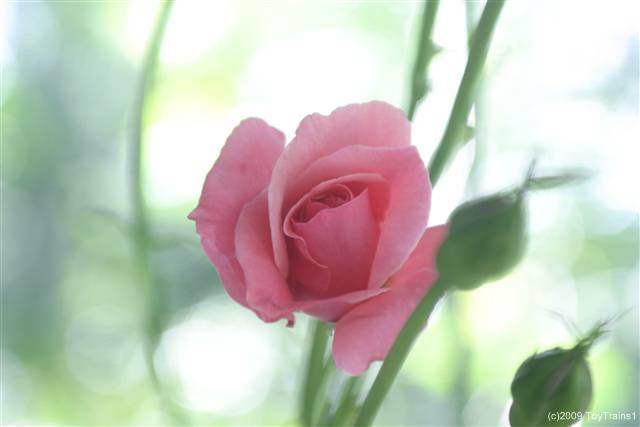 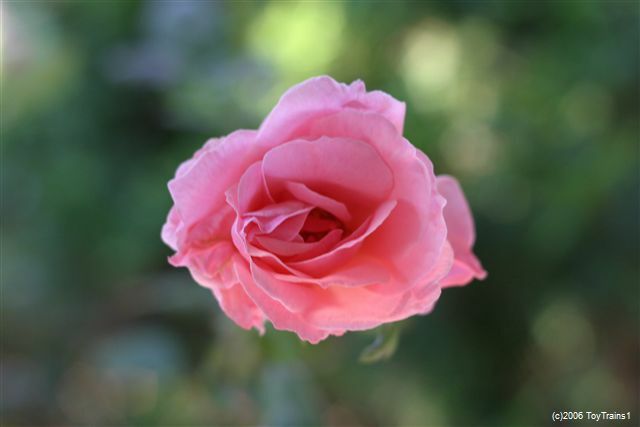 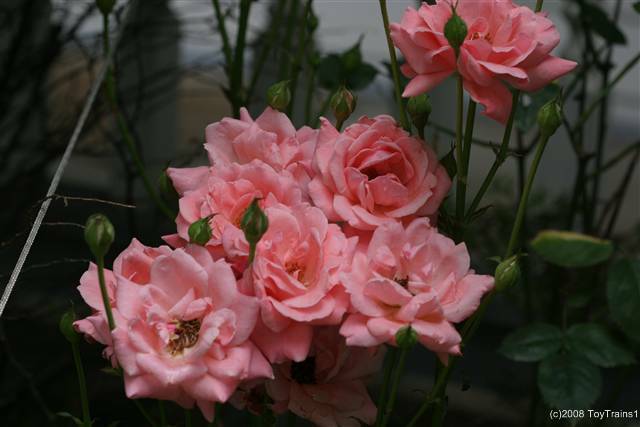 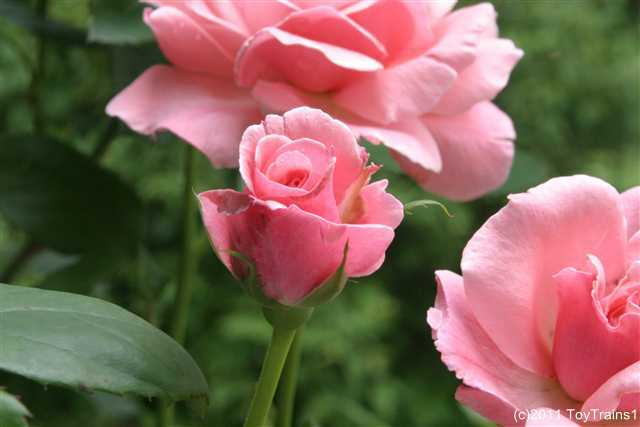 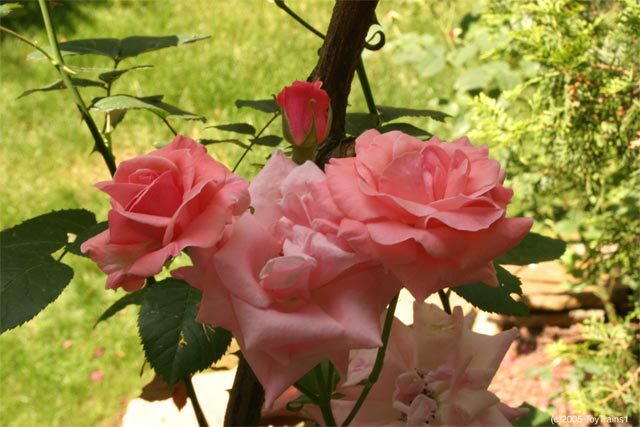 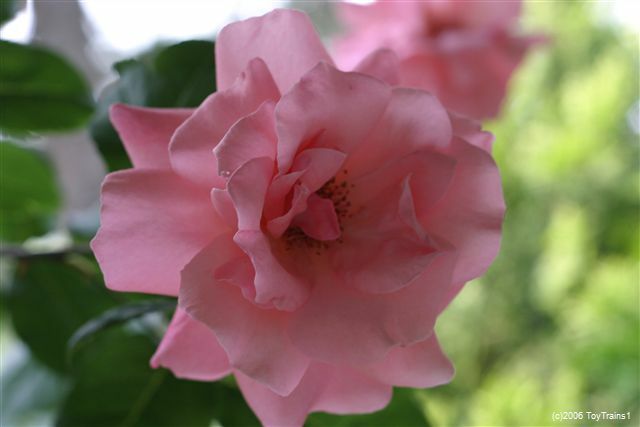 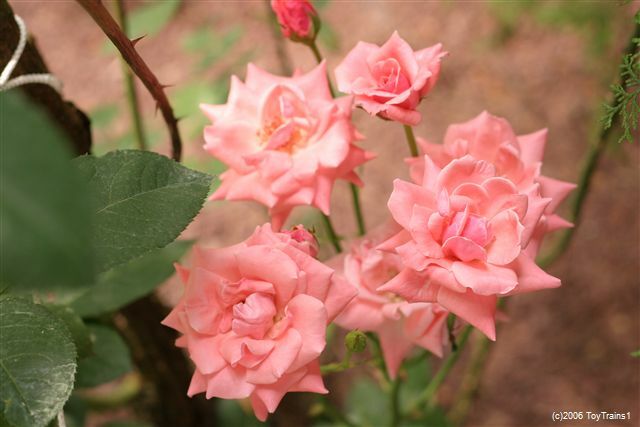 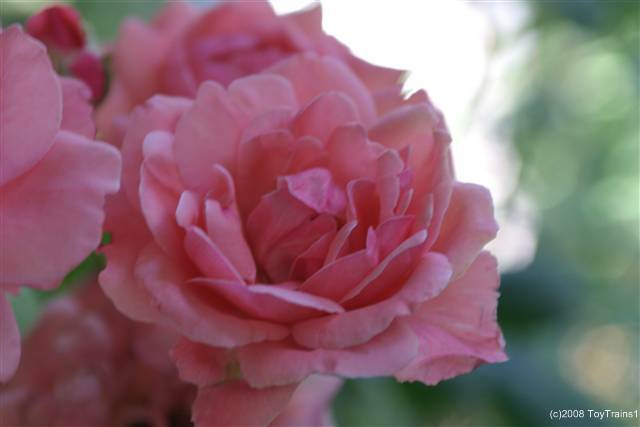 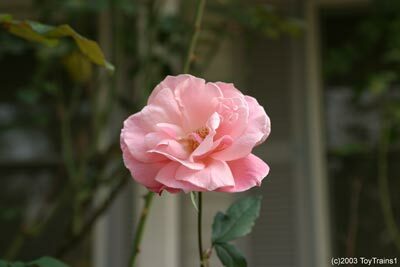 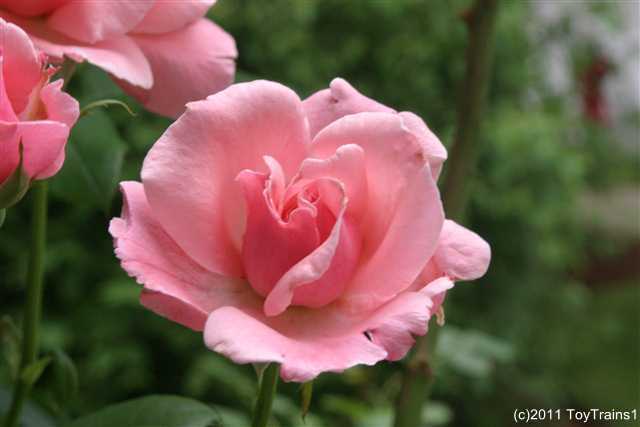 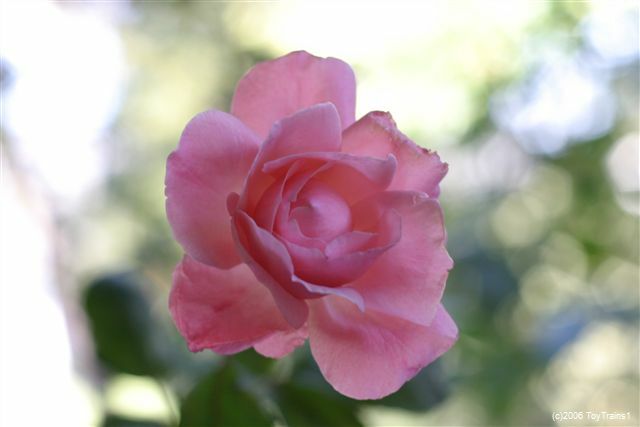 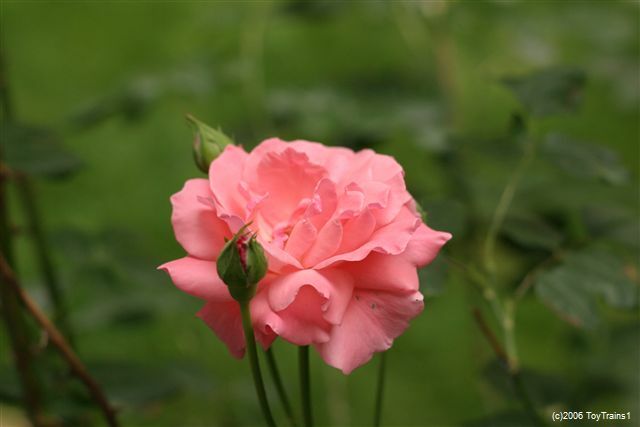 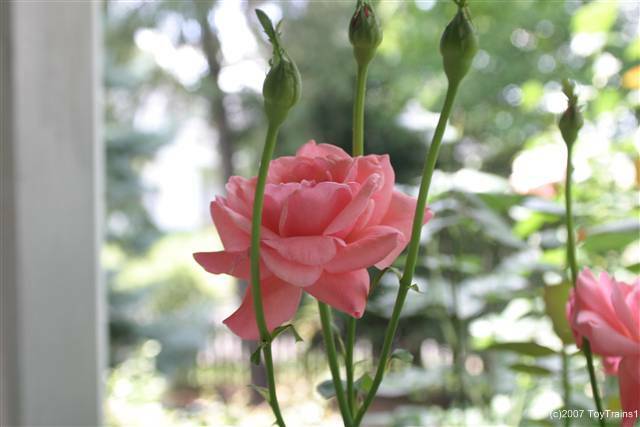 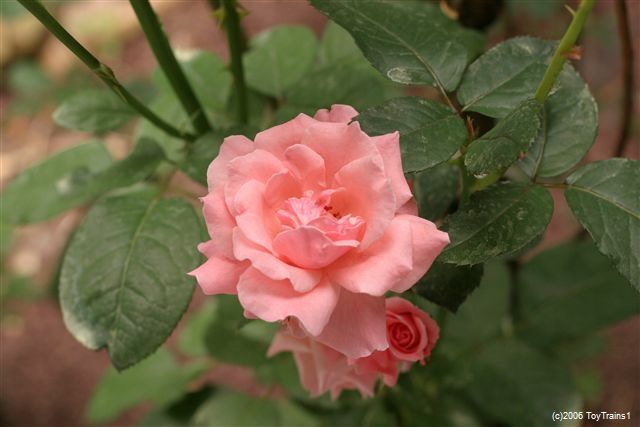 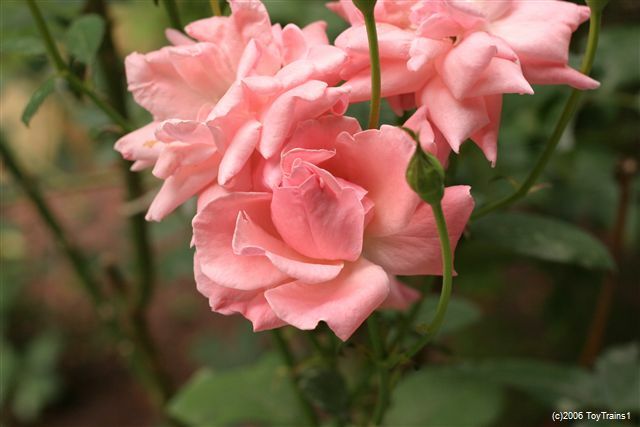 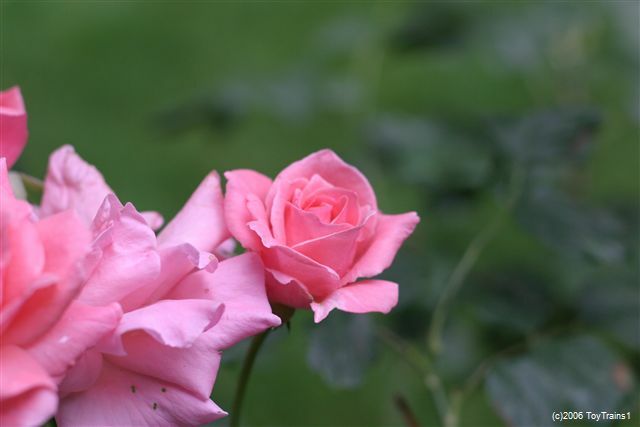 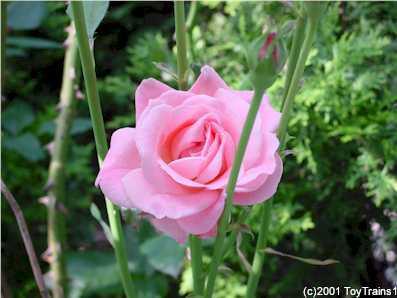 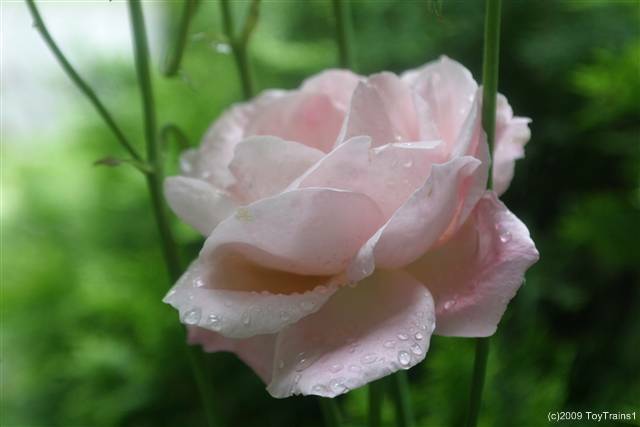 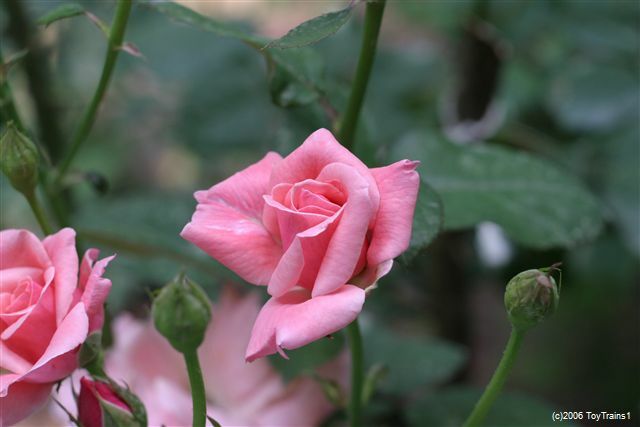 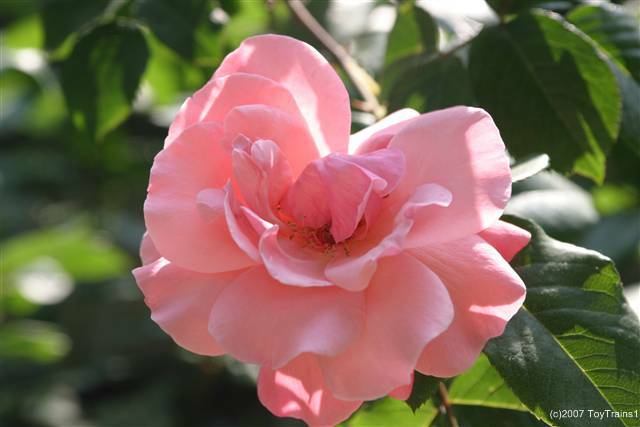 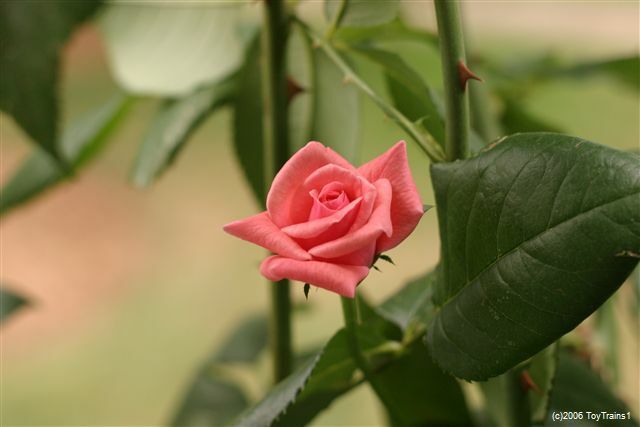 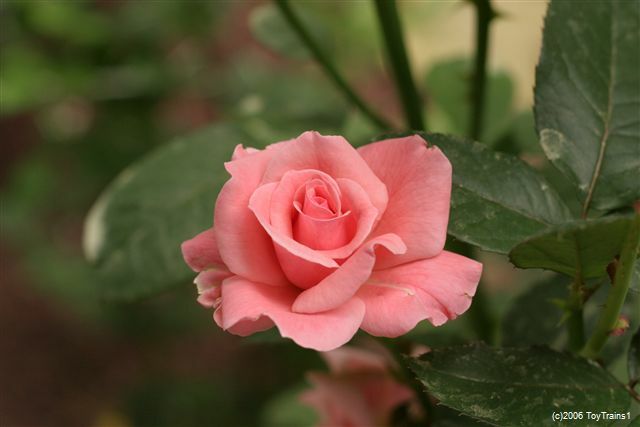 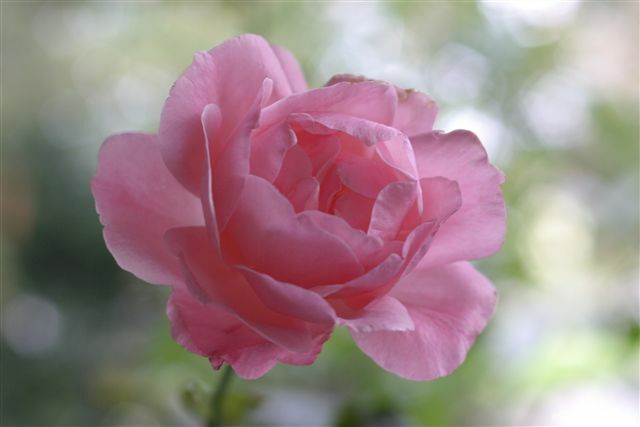 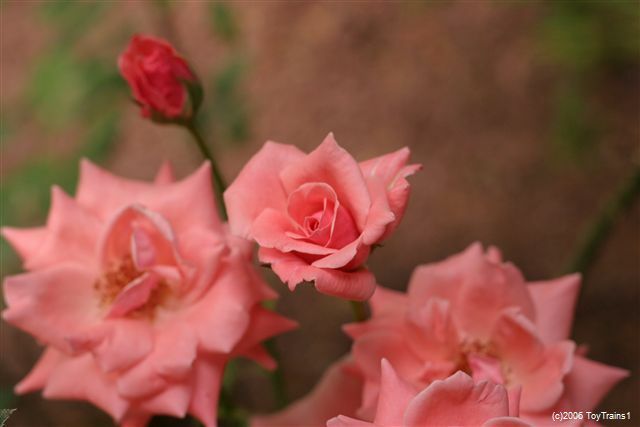 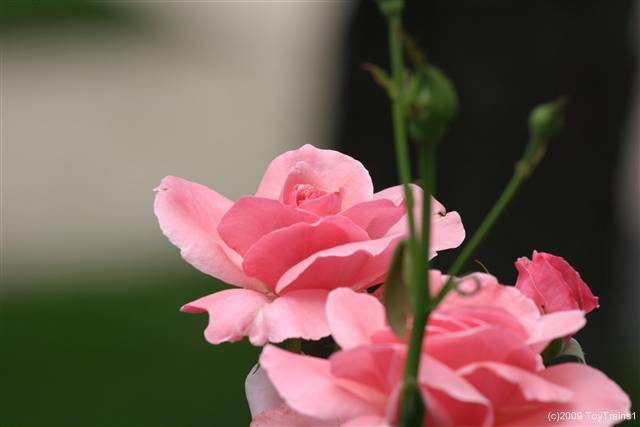 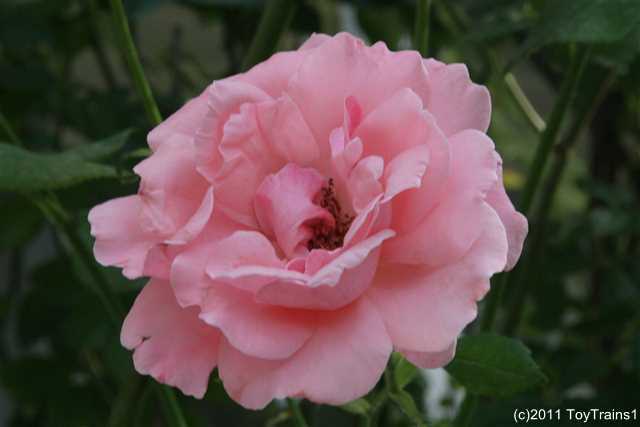 This class of rose, which was created for Queen Elizabeth, is typified by plants with hybrid tea-type blooms, but with many blooms on a single spray, typical of floribunda roses. 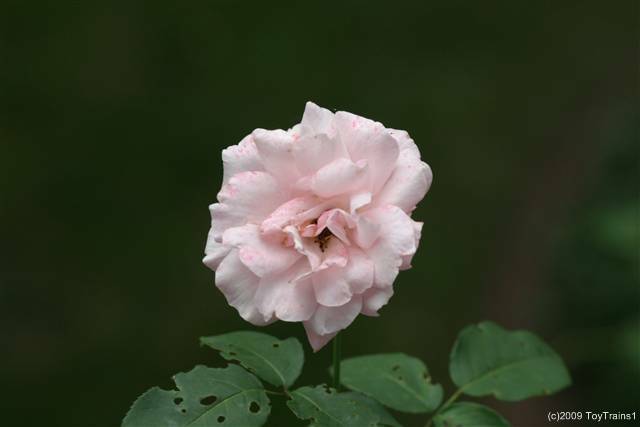 While striking in appearance, the flowers have little fragrance. 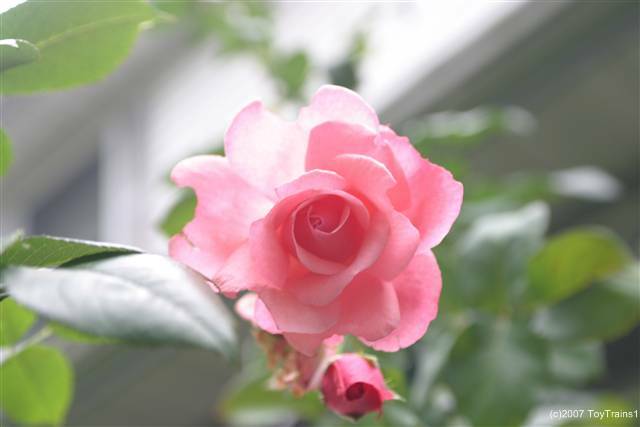 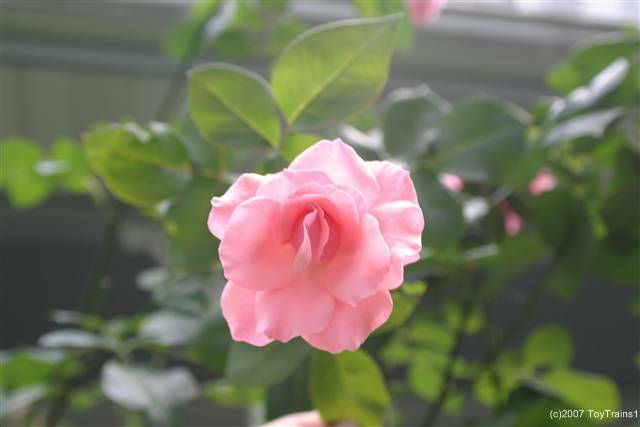 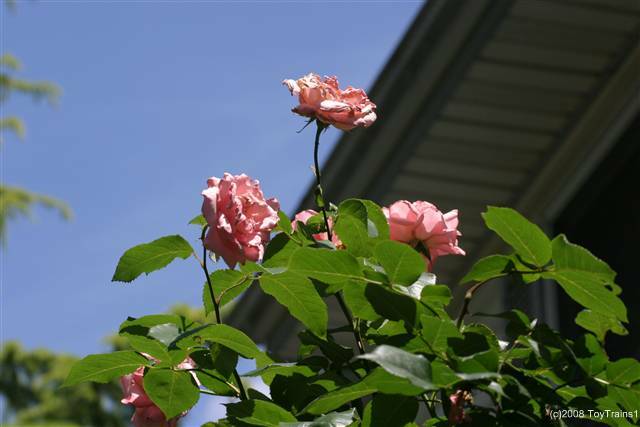 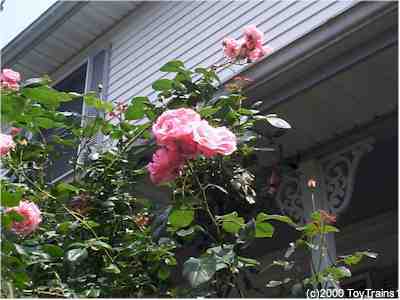 In 1999, Queen Elizabeth has made it up to the roof of the porch, and has begun its bloom, which will last all season. 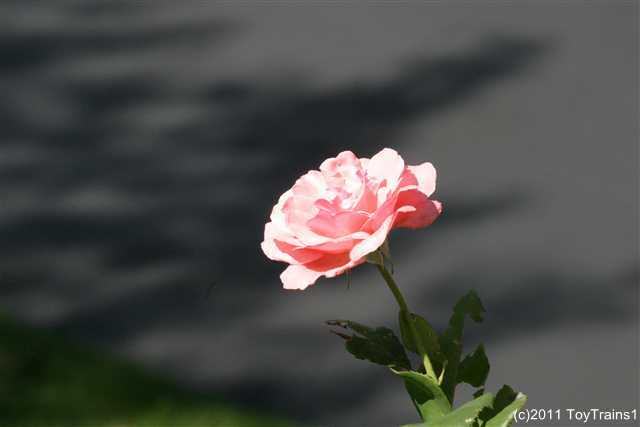 The photo below is much closer to the true color, though a bit on the purplish side. 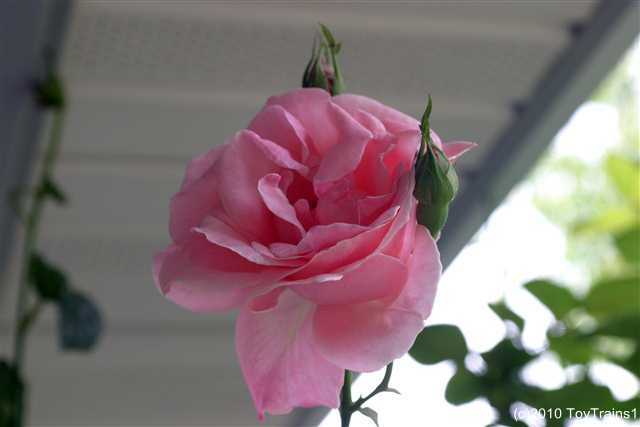 Queen Elizabeth has been blooming on and off all during the 1999 season, and is saying farewell to the year with an impressive flush. 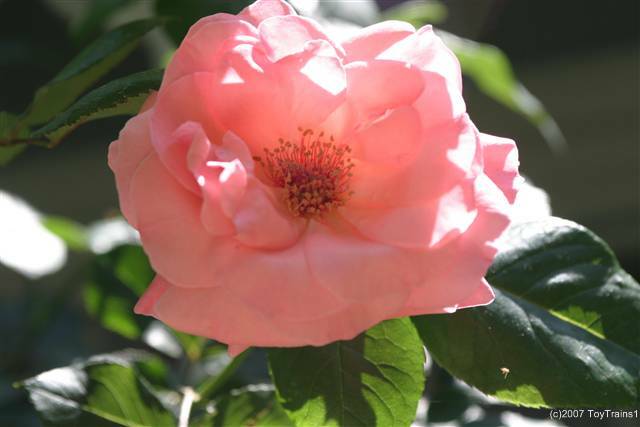 Mid-November, and Queen Elizabeth gives us one last blossom! 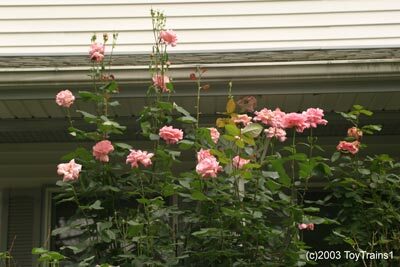 Even having topped off Queen Elizabeth, it's back up to the height of the porch roof and is once again in bloom -- Memorial Day weekend, 2001. 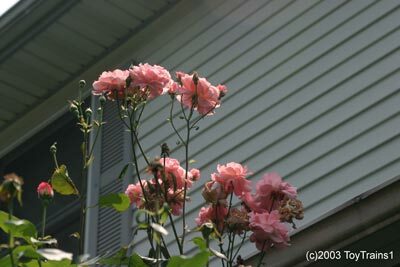 It's Memorial Day weekend, 2002, and like clockwork Queen Elizabeth has begun to bloom. 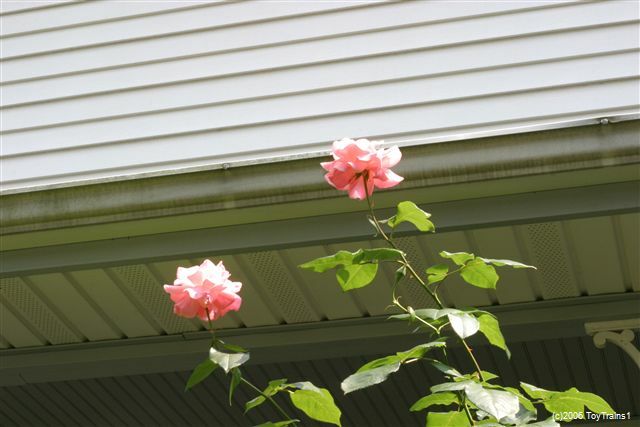 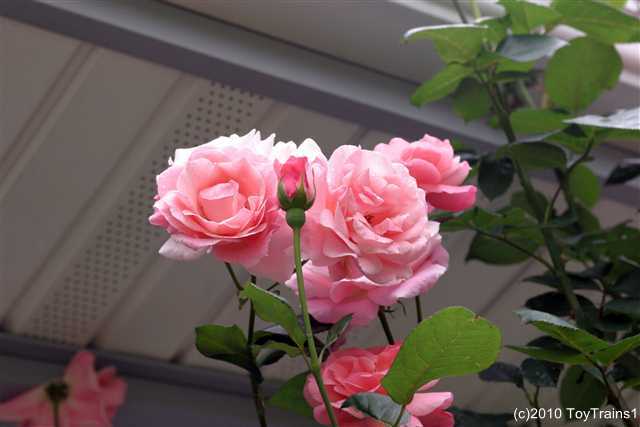 The first photo shows a rose that's up and over the porch roof! 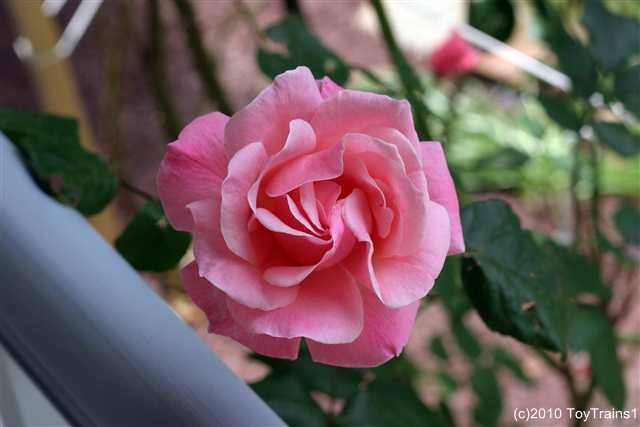 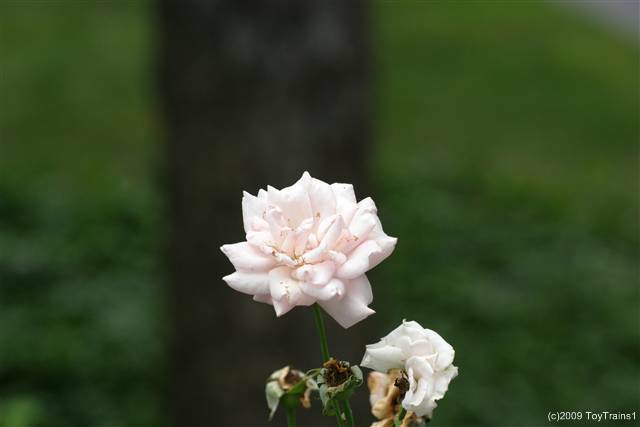 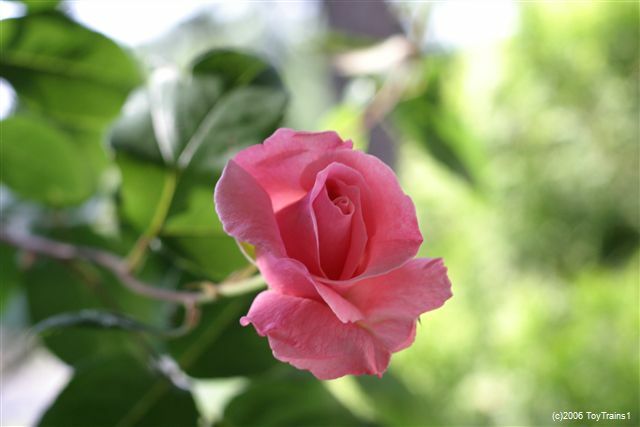 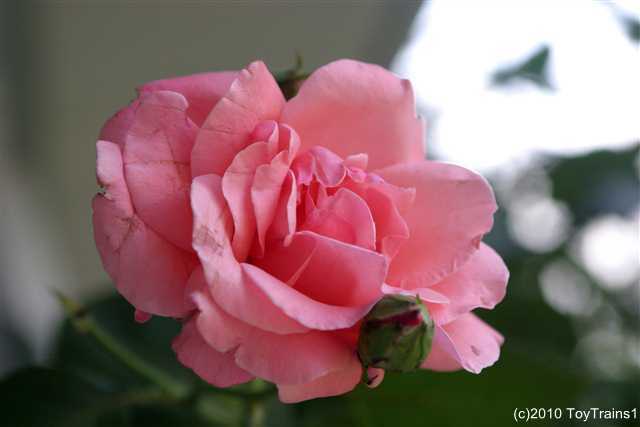 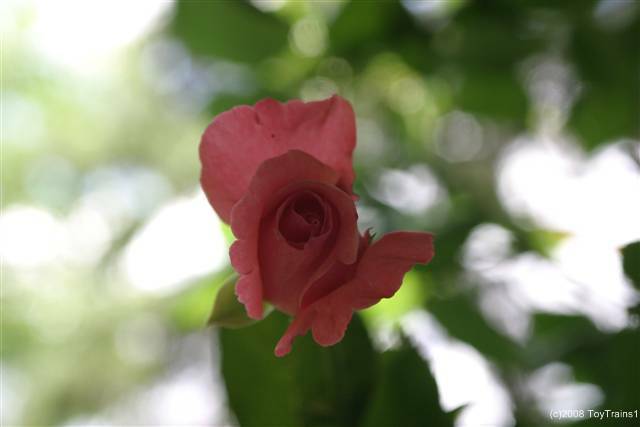 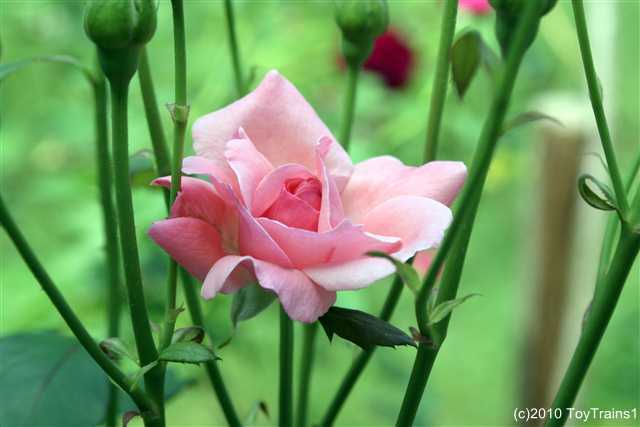 Queen Elizabeth was a bit slow to bloom in 2003; it's into the second week of June. 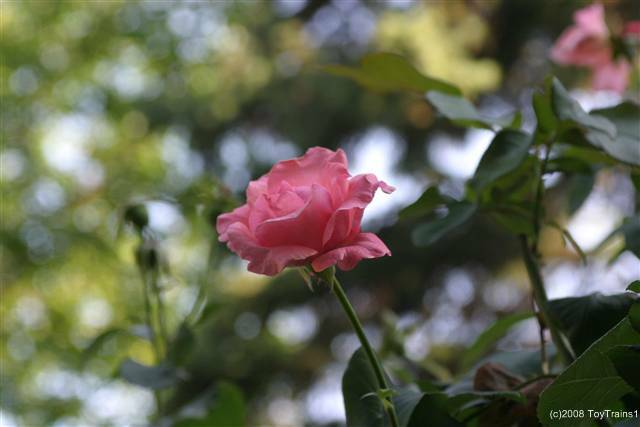 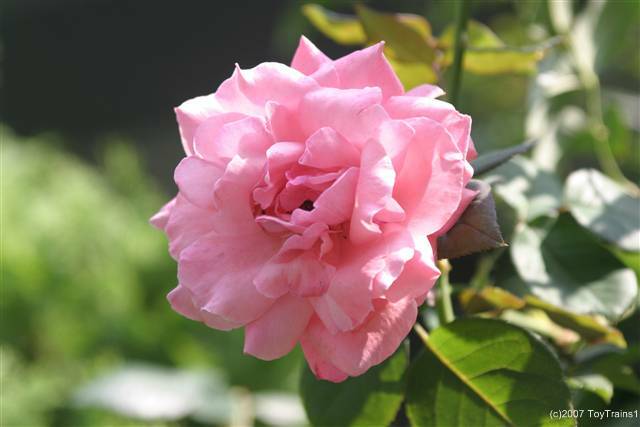 It's now the second of November and Queen Elizabeth is still in bloom! 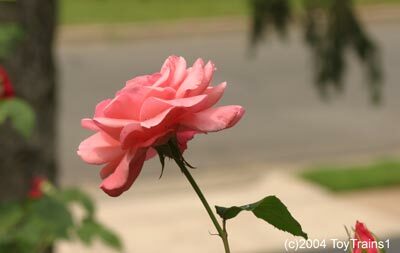 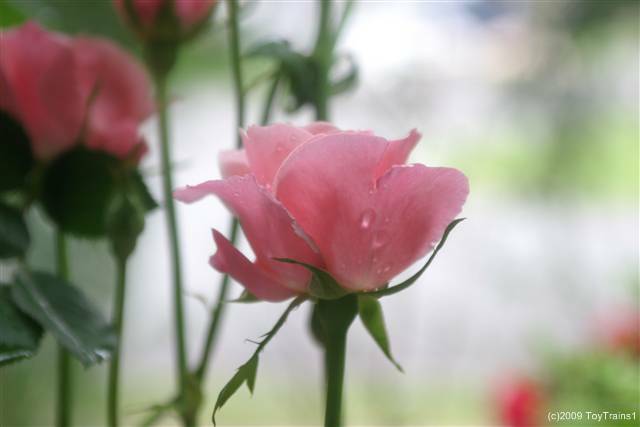 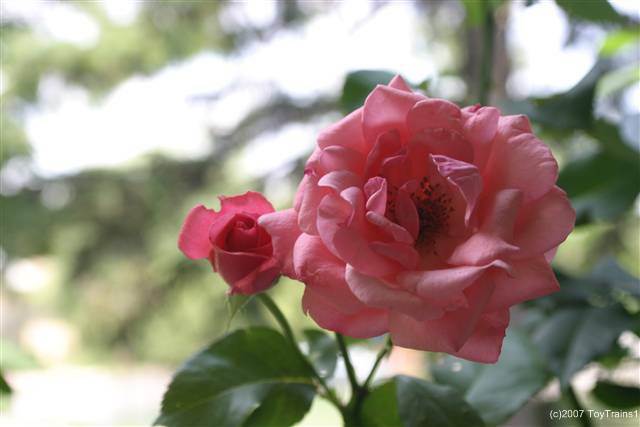 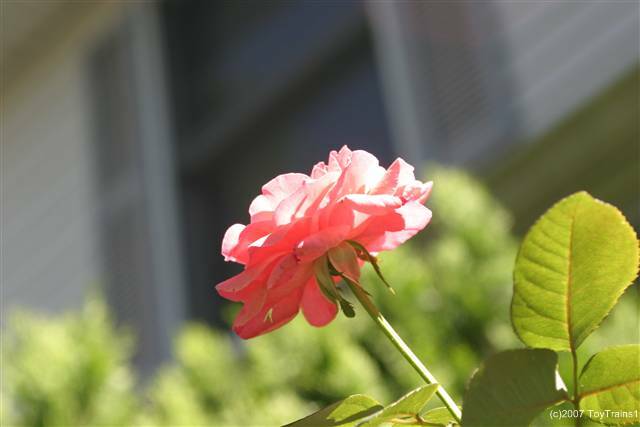 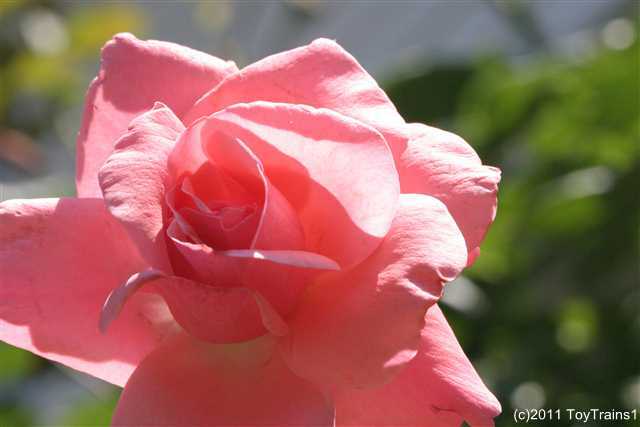 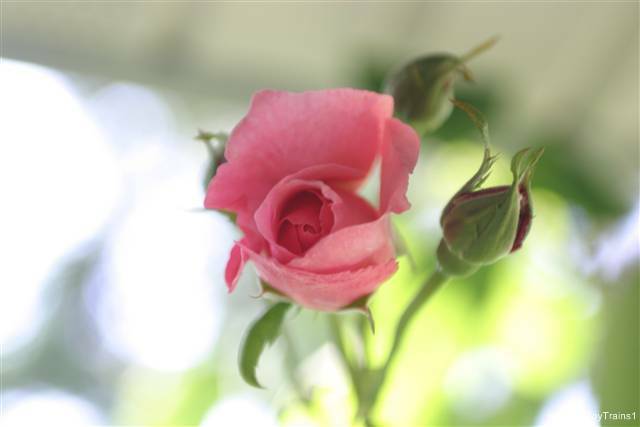 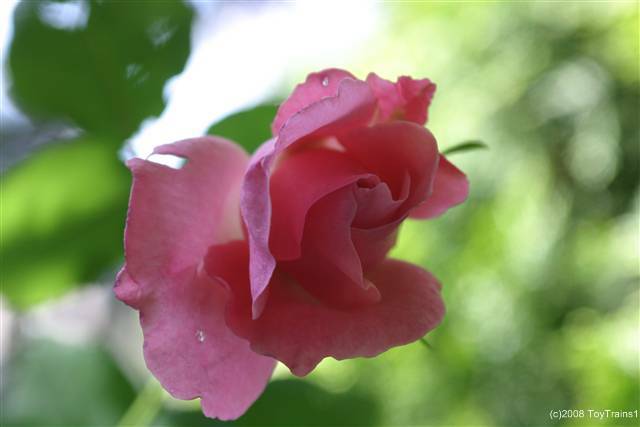 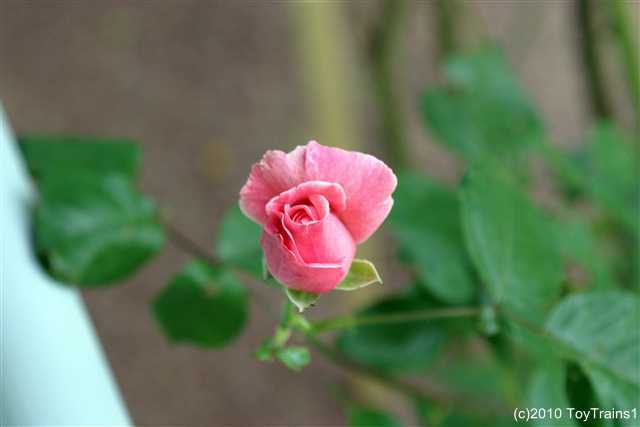 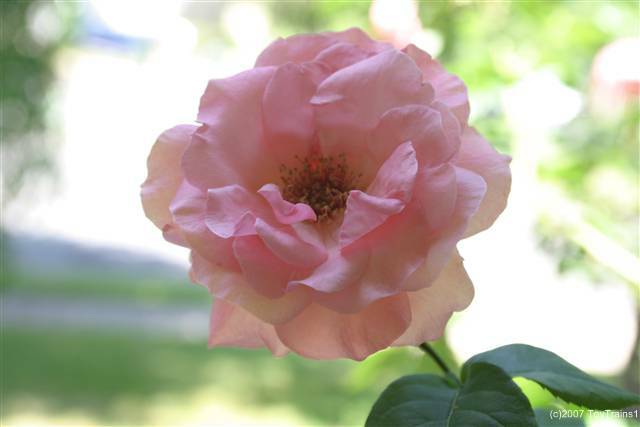 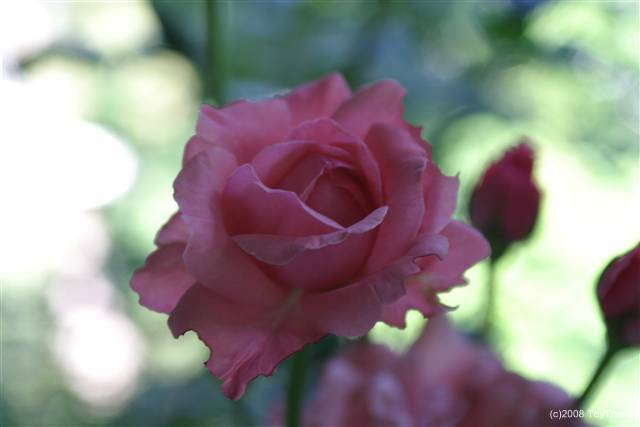 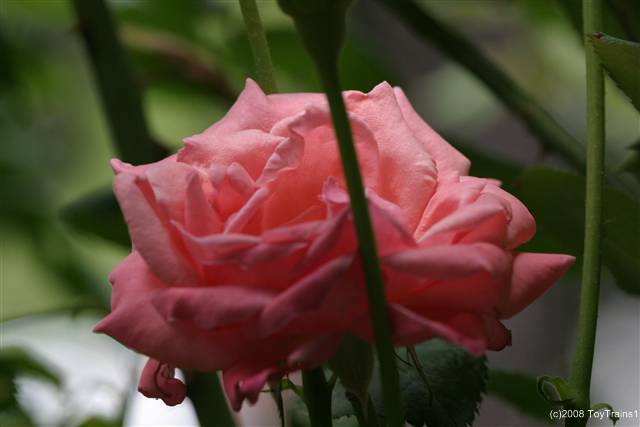 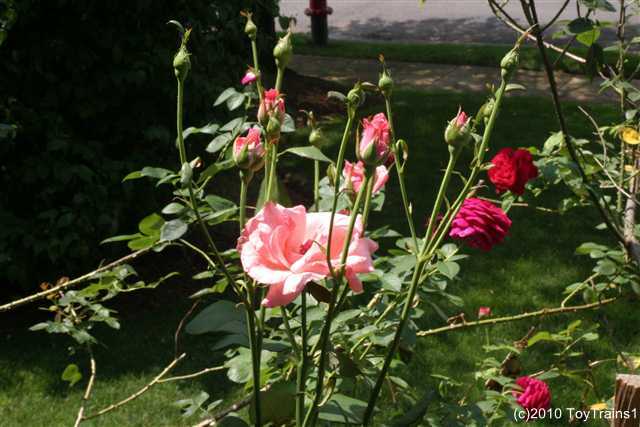 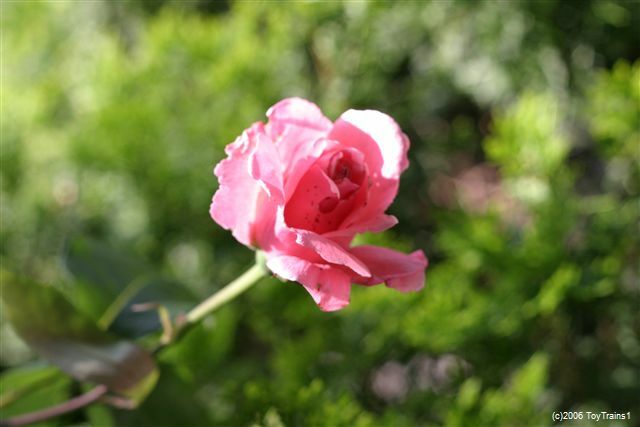 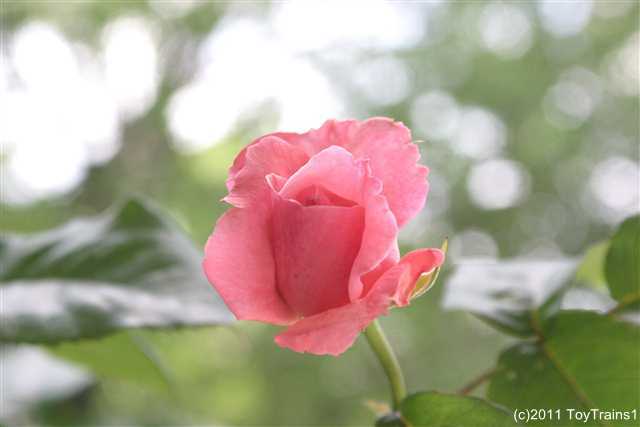 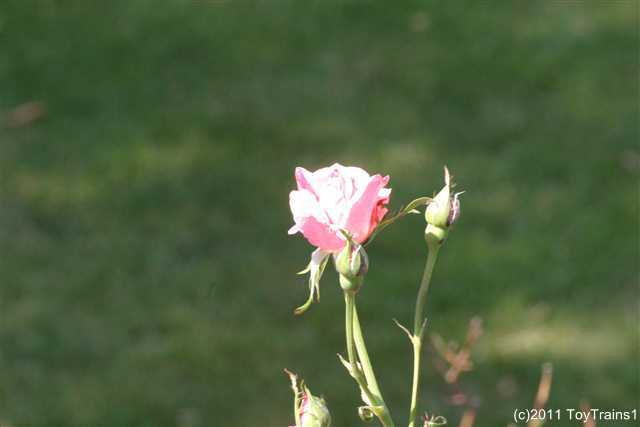 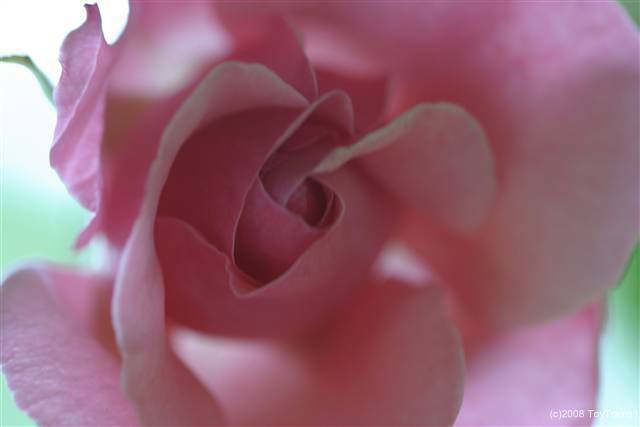 Late May 2004 and Queen Elizabeth has bloomed, one of the last roses to do so. 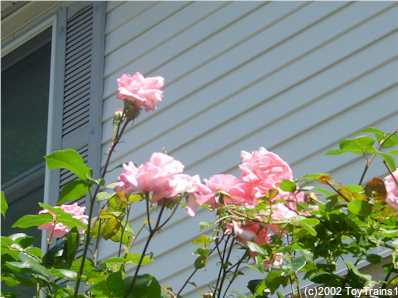 October .... this one is even with the windows on the second floor of the house! 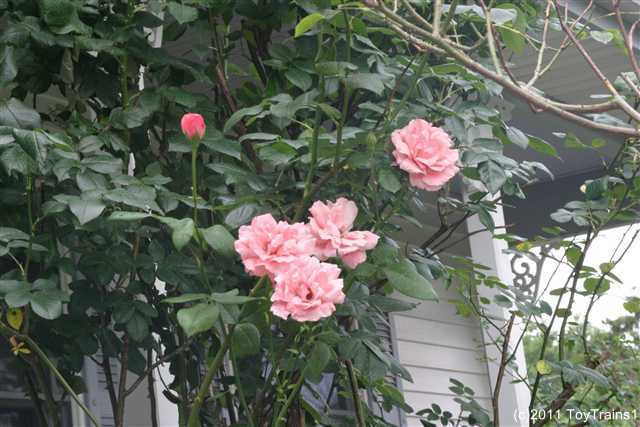 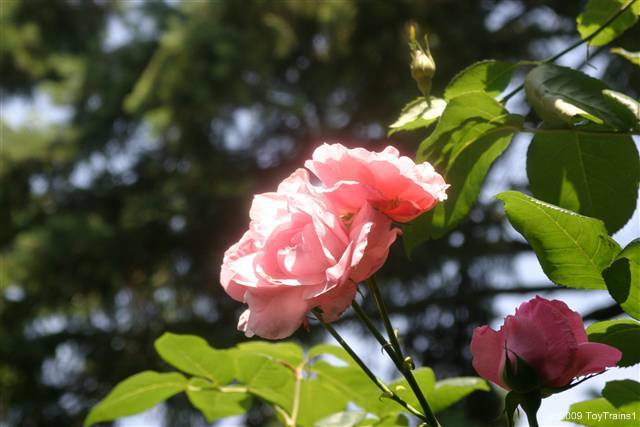 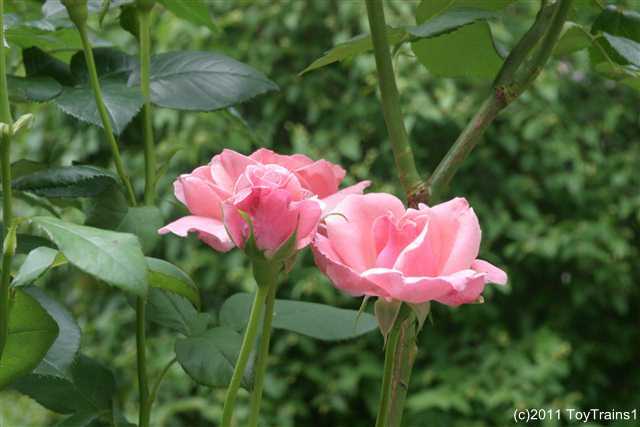 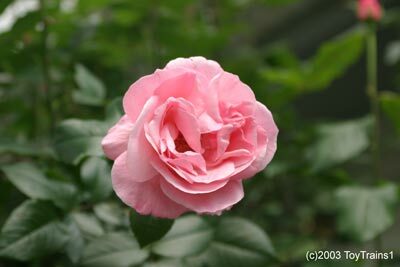 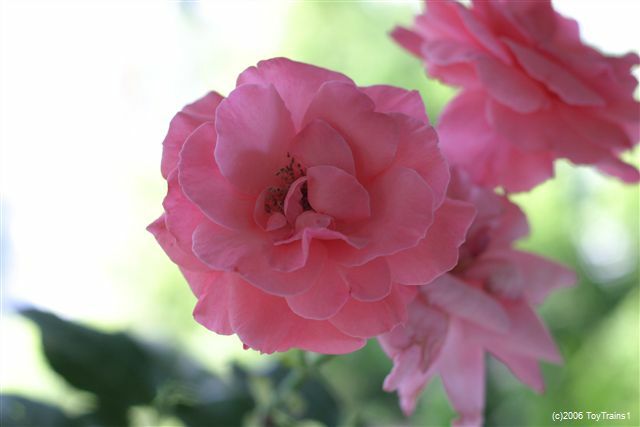 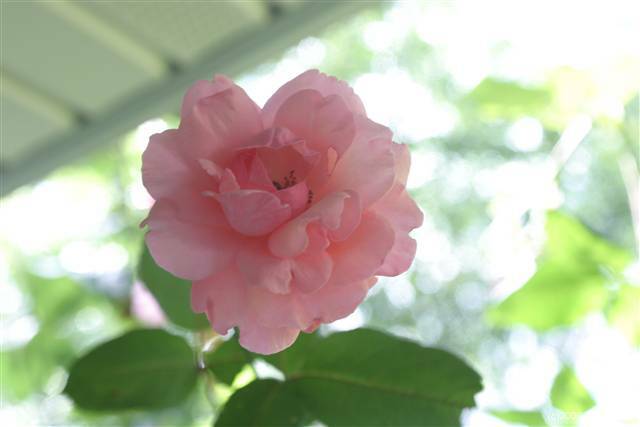 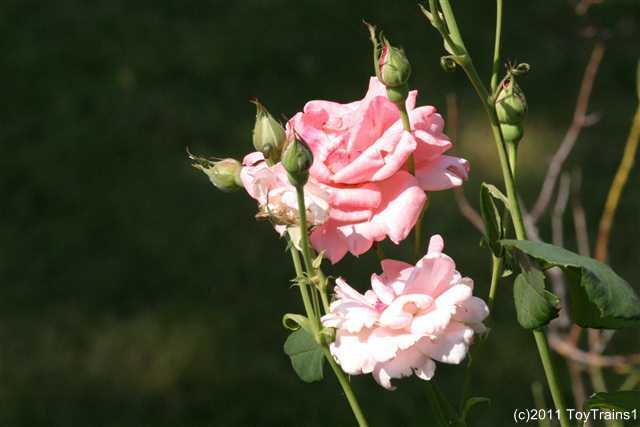 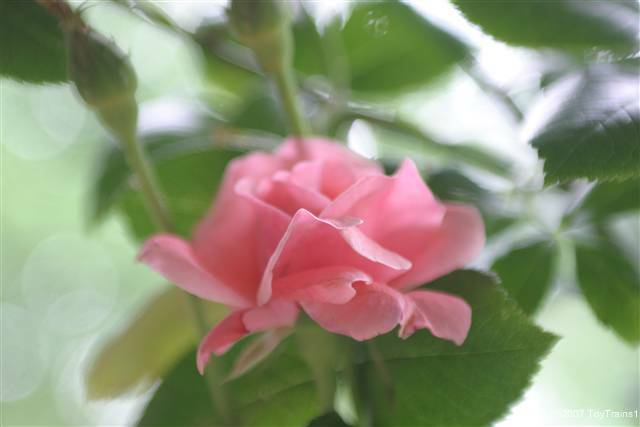 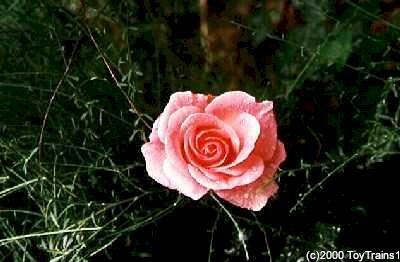 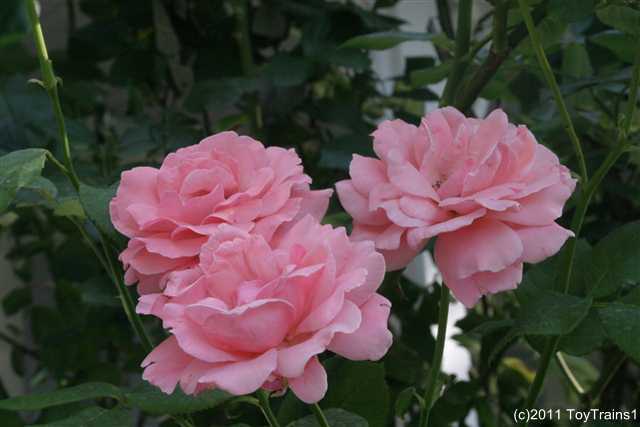 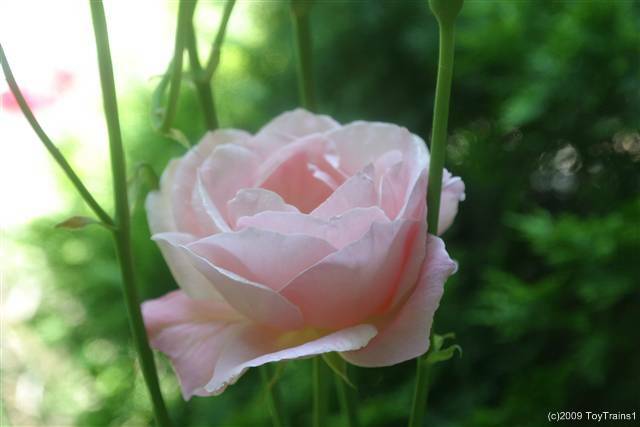 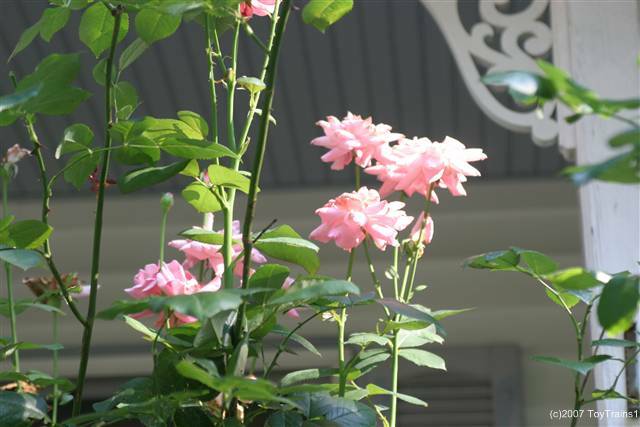 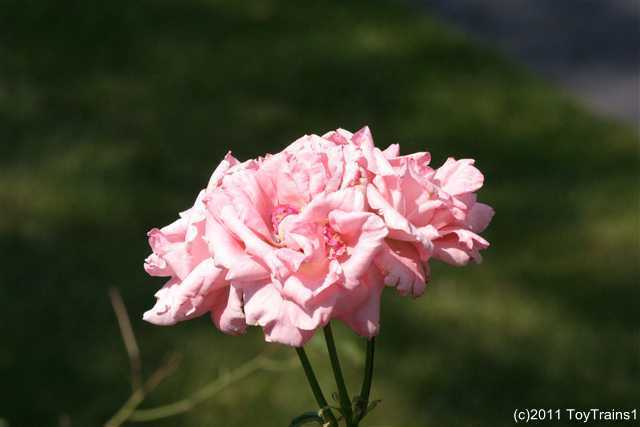 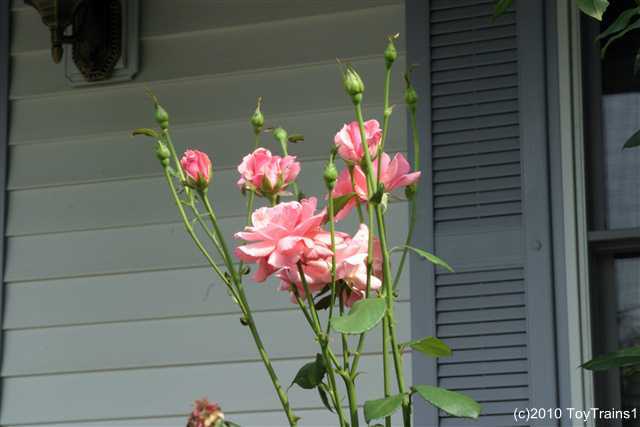 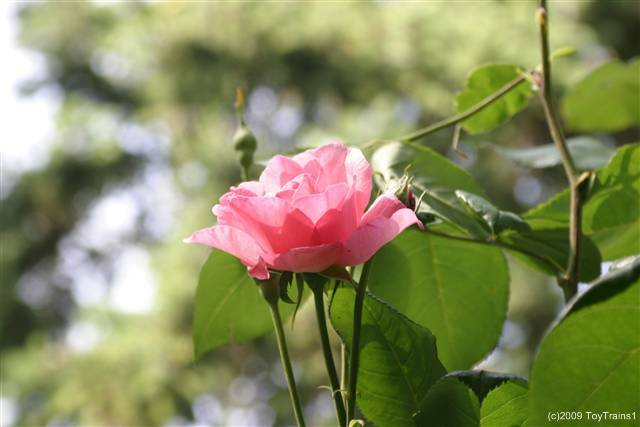 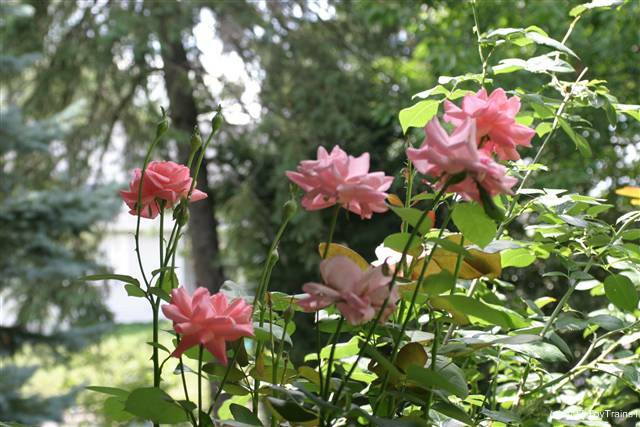 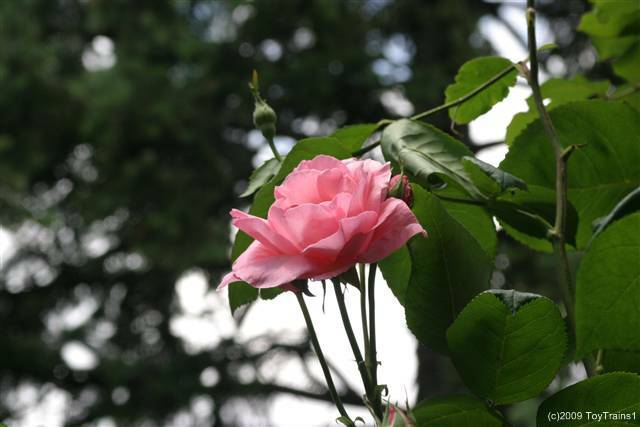 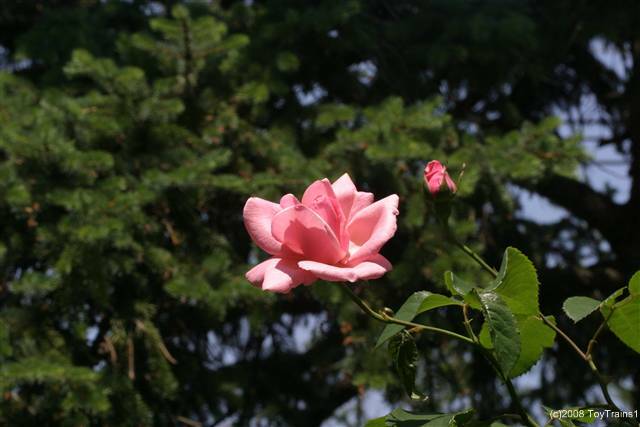 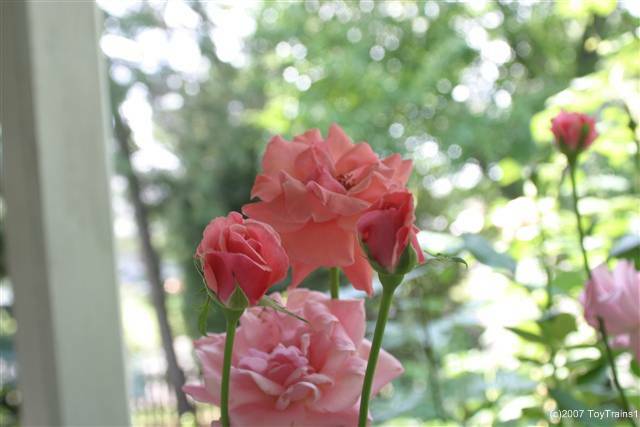 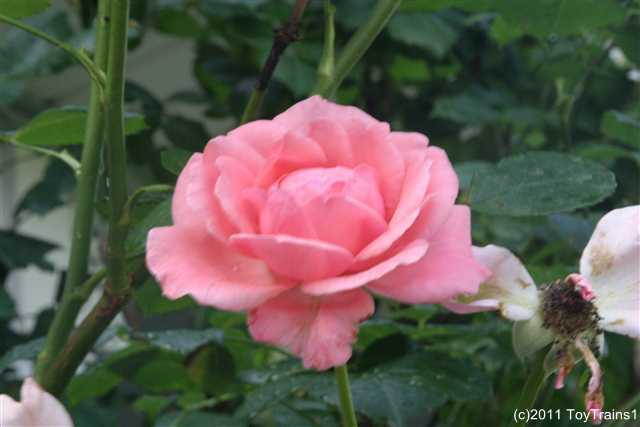 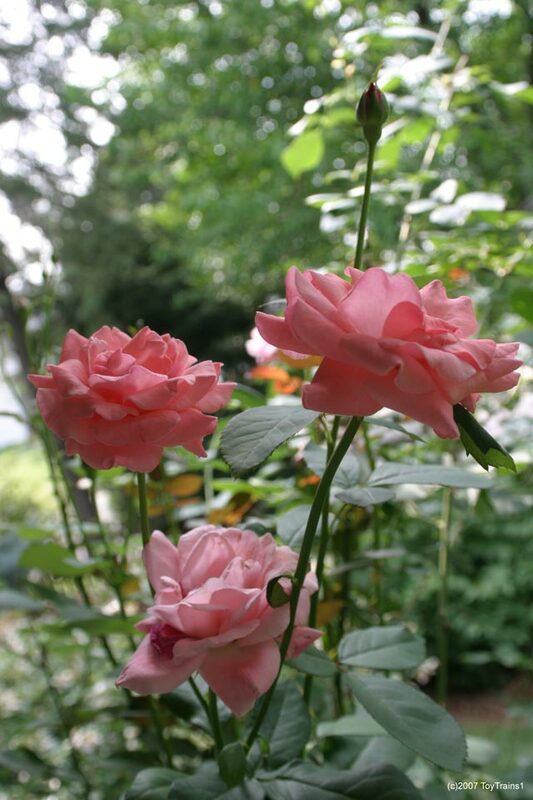 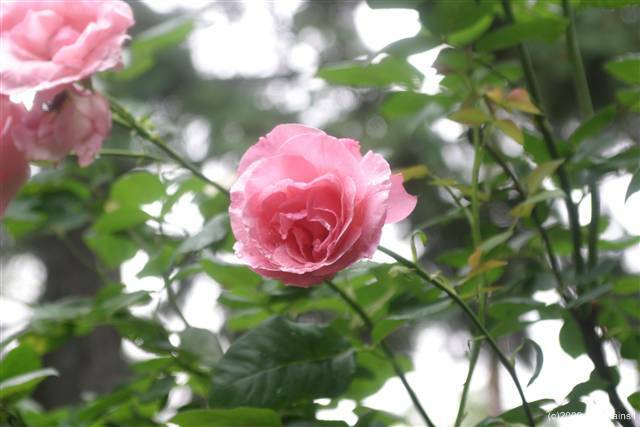 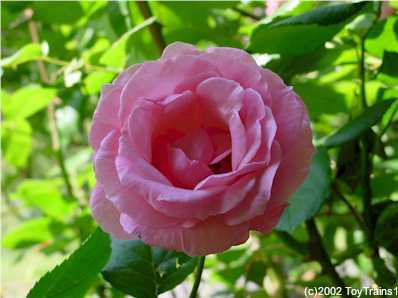 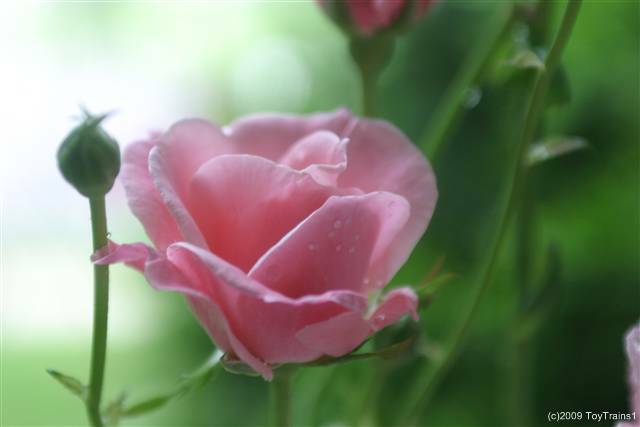 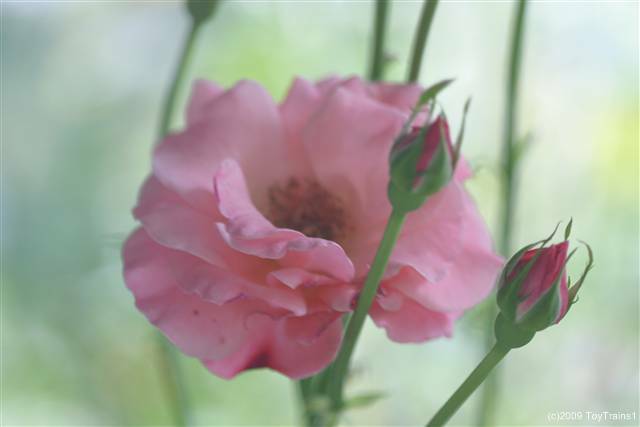 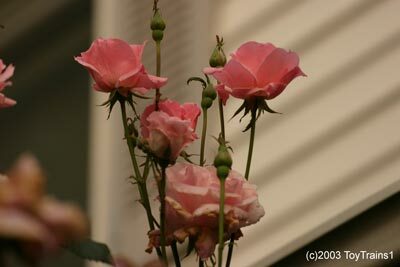 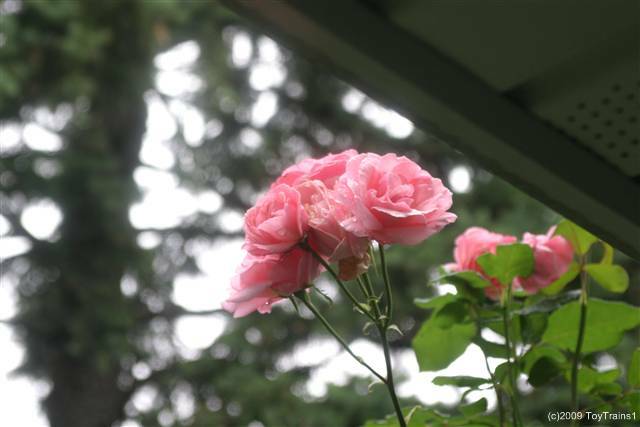 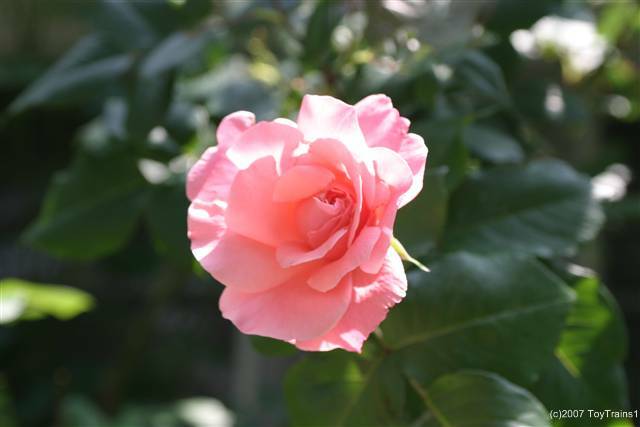 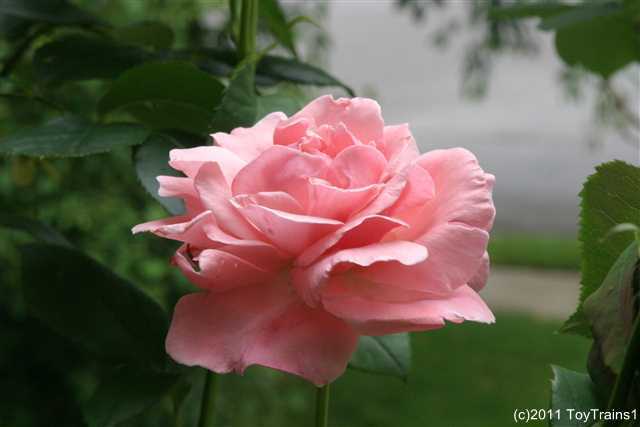 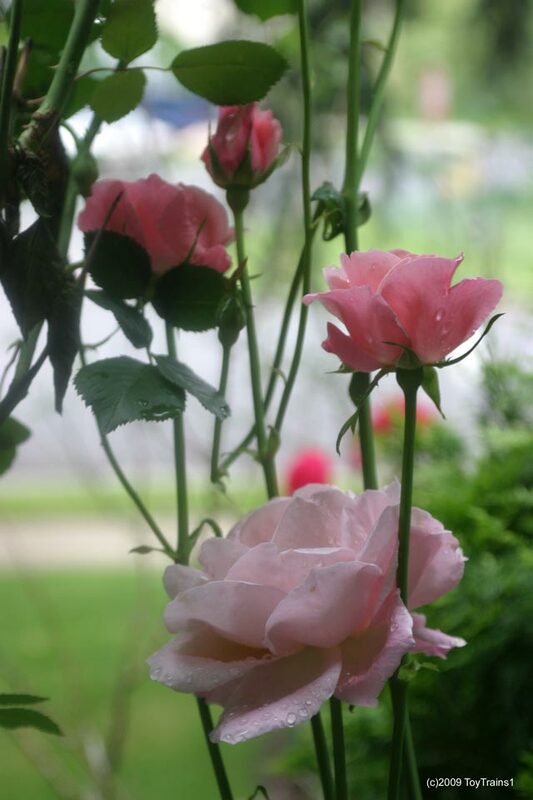 Queen Elizabeth was my first grandiflora rose and was planted in the spring after I had the house built. 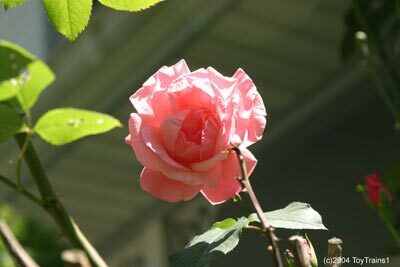 The horrendous winter of 2004-2005 did a number on it and I was afraid for a time that I was going to lose her but though much of the old growth is gone she has come back strong and now, in early June 2005, has begun to bloom. 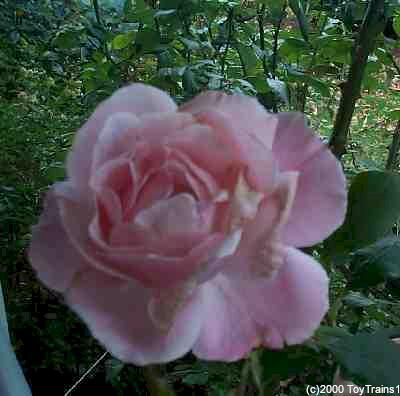 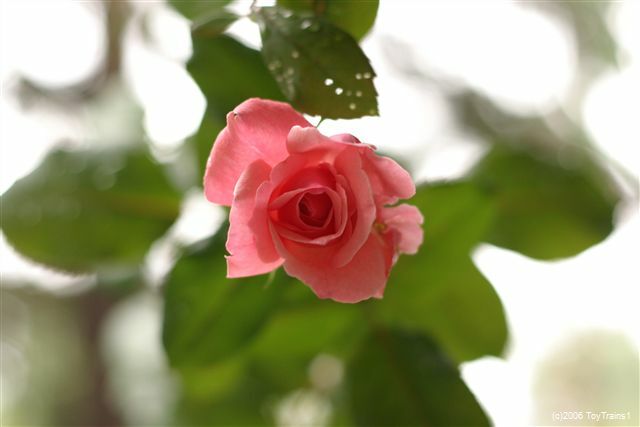 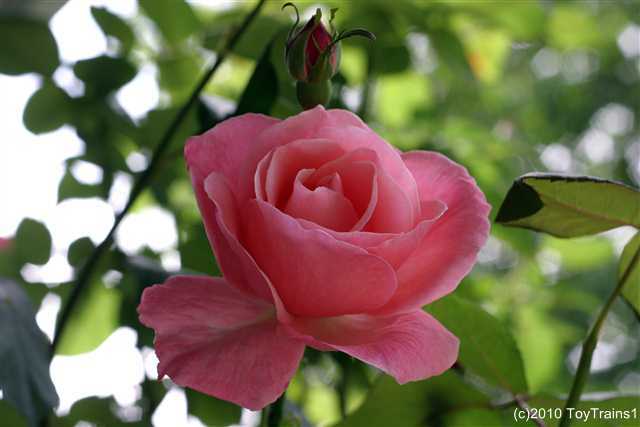 The last day of May 2006 brings with it the first blooms of Queen Elizabeth. 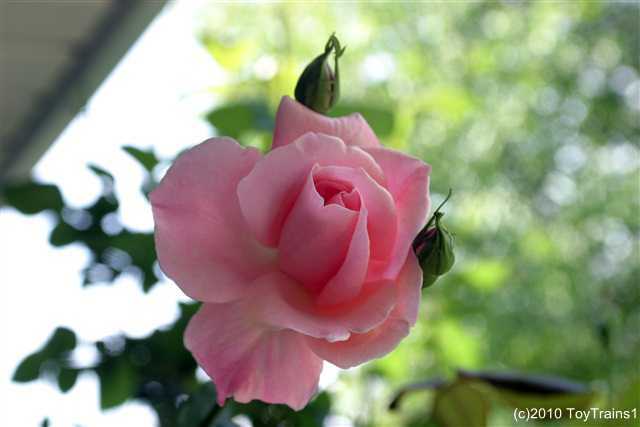 It's 10 July and Queen Elizabeth is starting to put on another show. 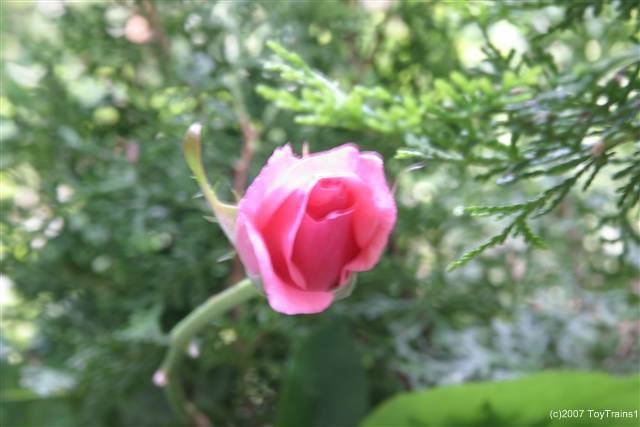 It's late August and Queen Elizabeth is starting to bloom again. 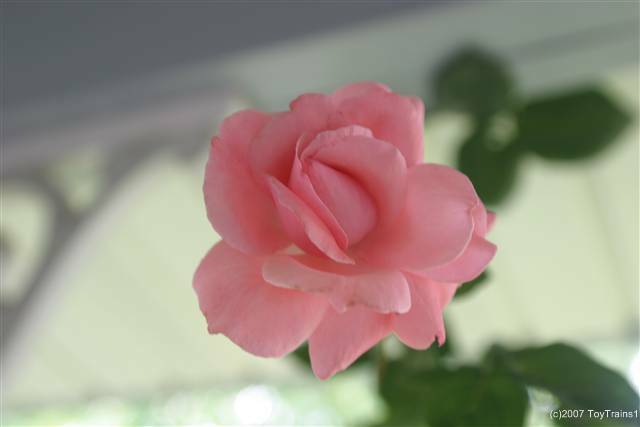 Grandiflora being grandiflora, this shot was taken from the second floor! 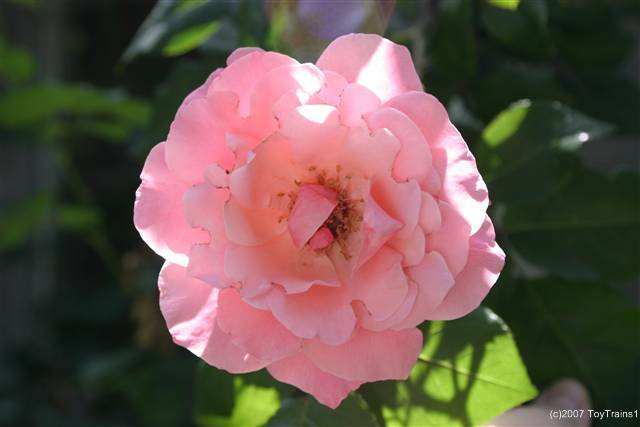 Early October sees Queen Elizabeth in full bloom. 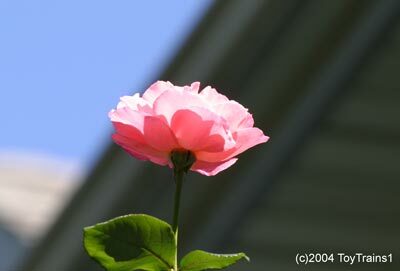 Memorial Day 2007 brings the bloom of Queen Elizabeth. 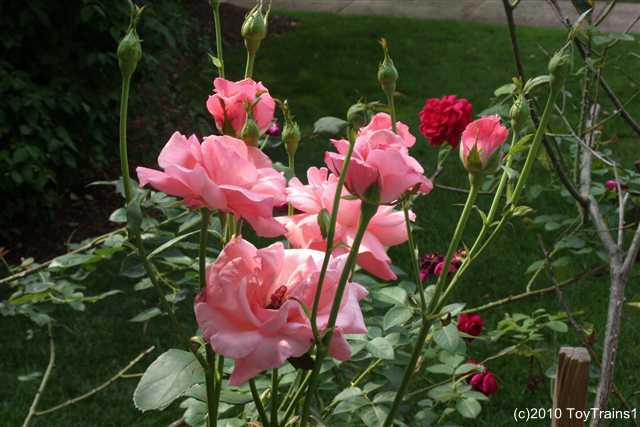 Mid-July bring another rush of blossoms from Queen Elizabeth. 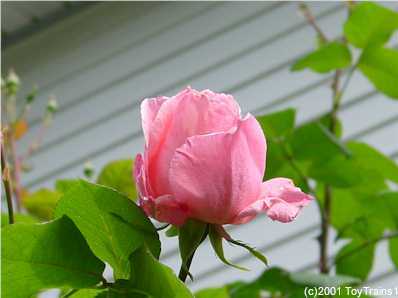 The beginning of June 2008 brings with it the beginning of the bloom of Queen Elizabeth. 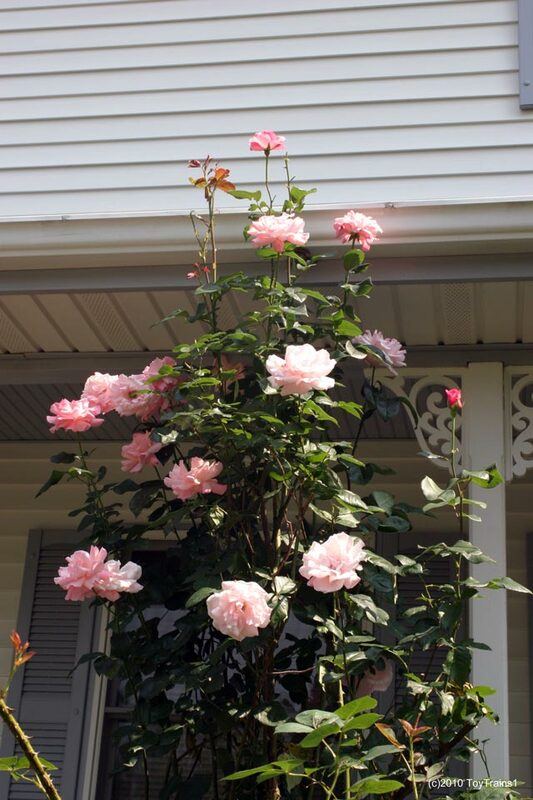 This one is about eight feet up in the air! 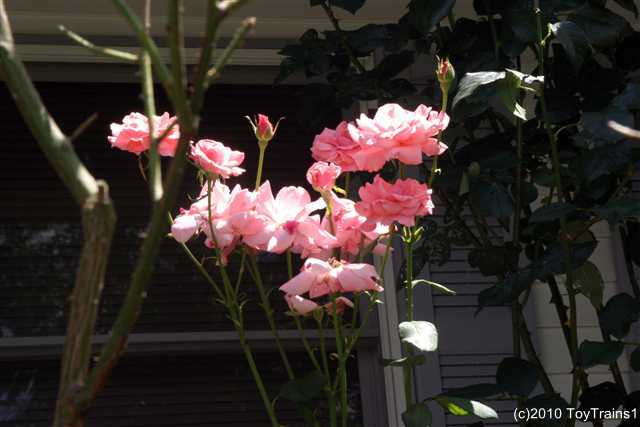 Mid-July has Queen Elizabeth full of flowers. 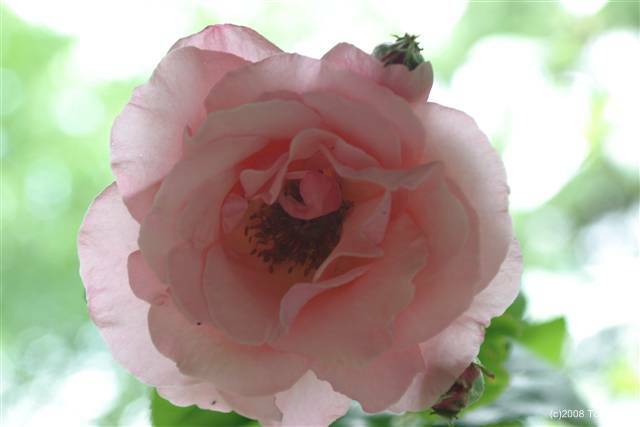 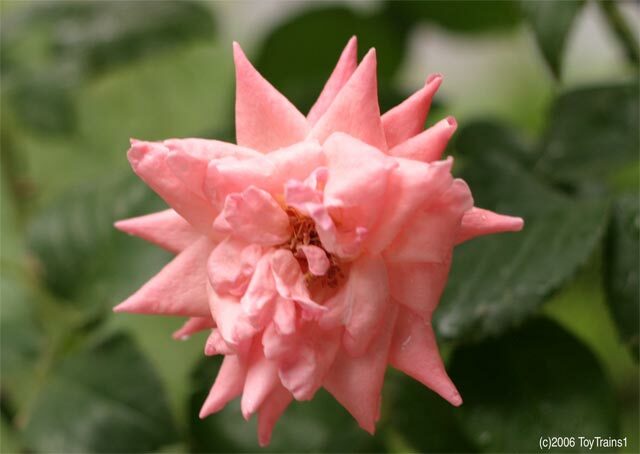 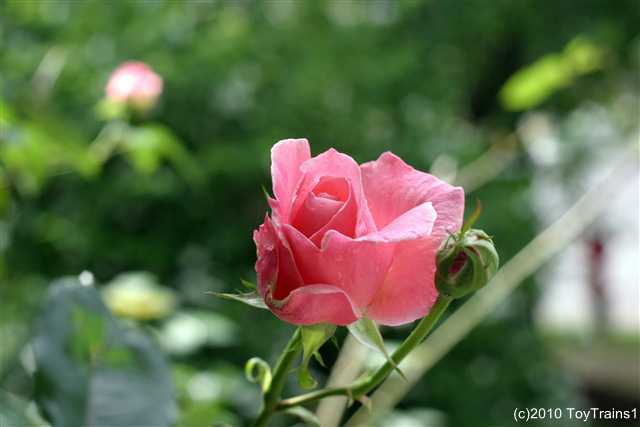 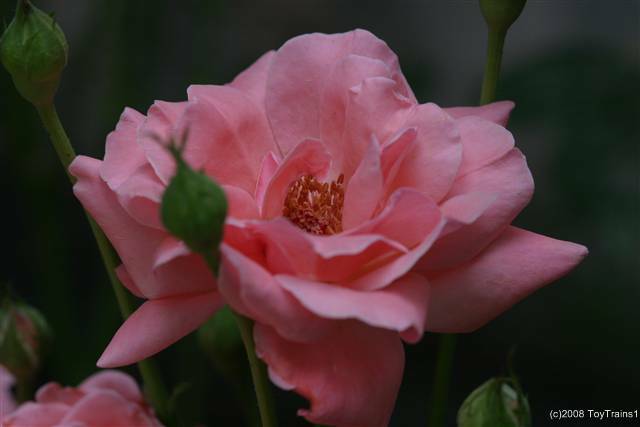 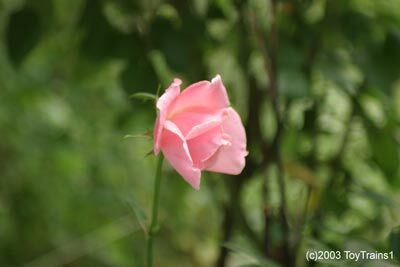 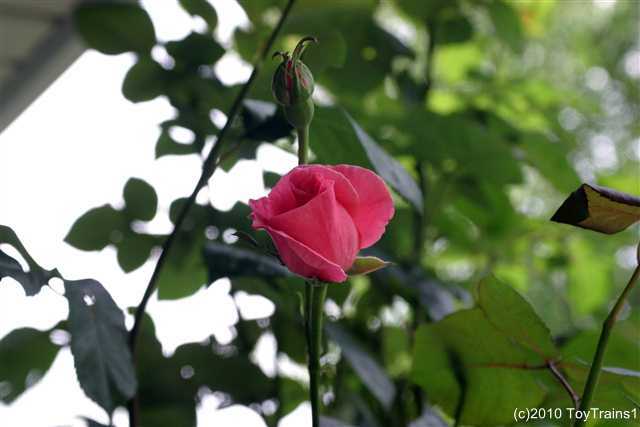 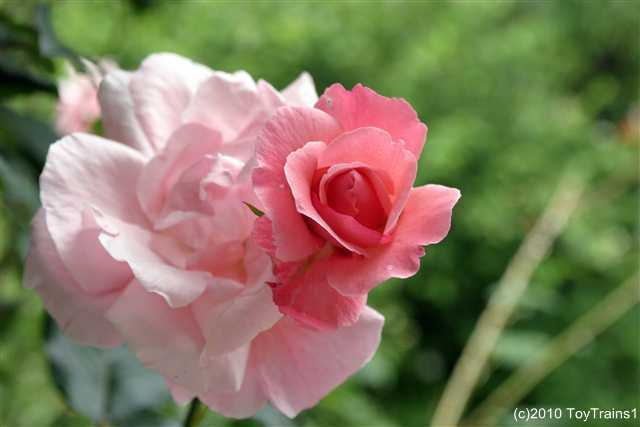 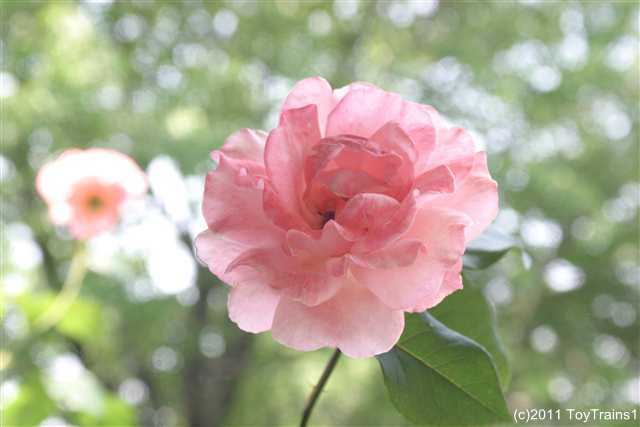 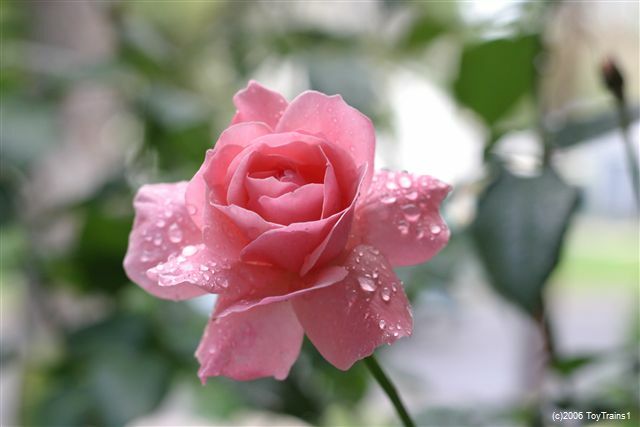 The beginning of June 2009 brings with it the first bloom of Queen Elizabeth. 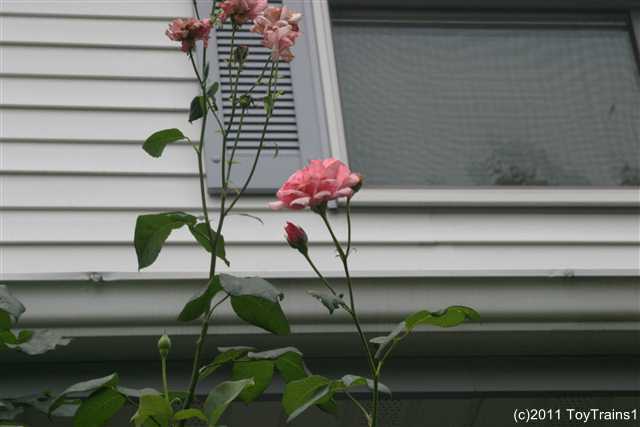 Queen Elizabeth has grown so high, the next two photos were taken from a second floor window! 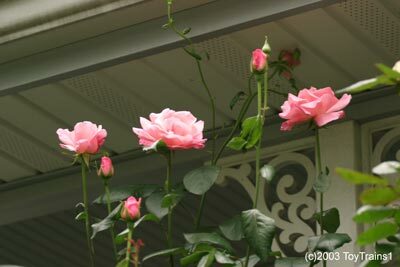 It's getting toward the end of May 2010 and Queen Elizabeth has begun to bloom. 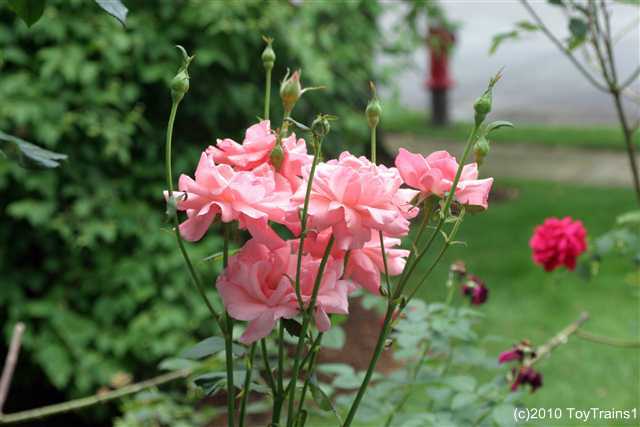 In late June/early July, Queen Elizabeth has been putting on quite a show! 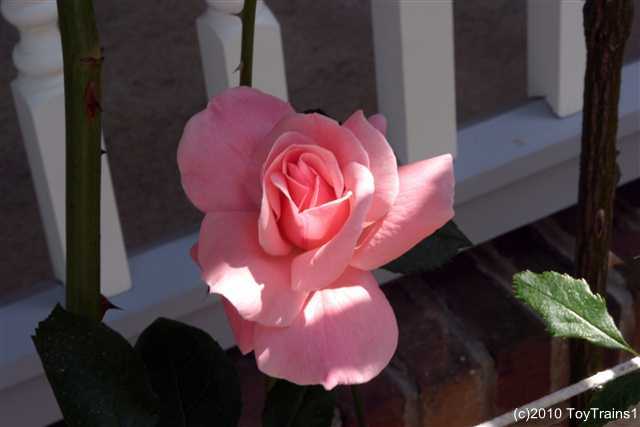 Memorial Day weekend 2011 brings with it the first bloom of Queen Elizabeth. 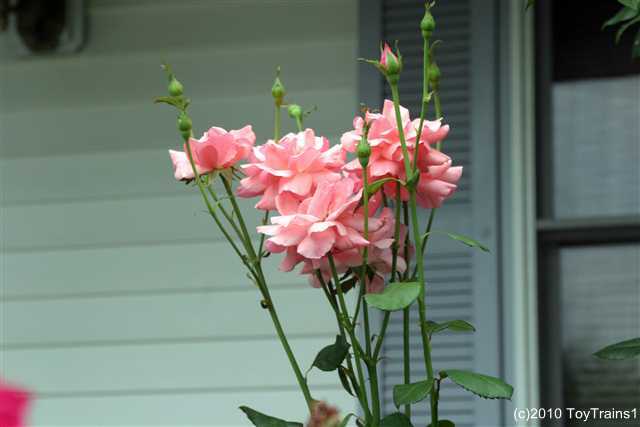 Having started late, Queen Elizabeth is going strong as the summer begins. 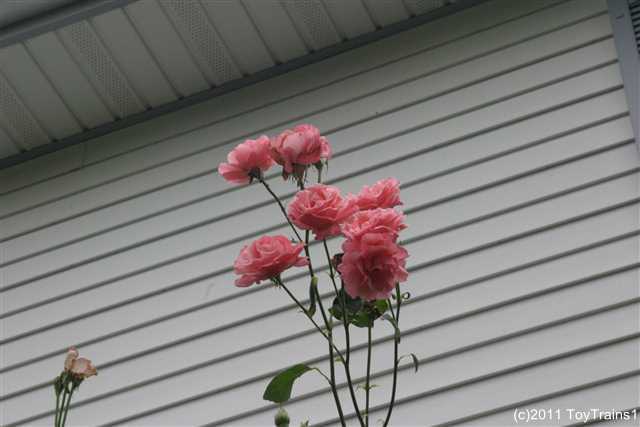 Queen Elizabeth is up and over the front porch roof! 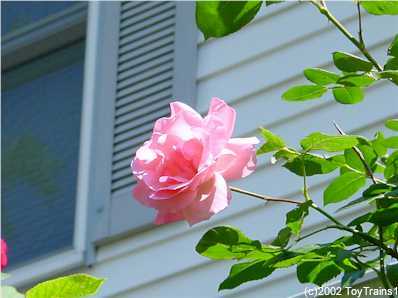 I had to take this photo from a second floor window!